A local industry long forgotten, but still in the distant memory of those born around 1920, is that of range animals. Cattle and sheep once roamed the savannas and forests of Jackson County foraging on the native grasses. Several families in the St. Martin and Latimer communities north of Fort Bayou were especially well known for sheep husbandry. Some of these clans were the Basque, Krohn, Lamey, Seymour, Lemien, Eglin, Havens, Letort, and Ramsay families. The people living north of Ocean Springs in the piney woods were primarily subsistence farmers. They raised corn and hay to feed their cattle and hogs, had vegetable gardens, and supplemented their incomes through charcoal burning, lumber, and the wool from sheep. It was common for a farmer to own as many as a thousand sheep. In fact, the wealth of farm and country people was determined by their peers from the number of sheep that they possessed. Sheep were generally never enclosed in pastures. The range was open to everyone and the stock animals of each owner mixed together. This necessitated marks and brands to differentiate ownership of the animals. From the Books of Stock Marks and Brands at the Jackson County Archives in Pascagoula, it can be ascertained the brands and marks of many individual animal owners. For example, in August 1919, Mary Doyle Krohn registered her brand as a V on the right hip of the animal. The brand and mark were valid for cattle, sheep, hogs, and goats. In the spring on an appointed day, the stock owners had a "round up". On horseback, they drove the free ranging sheep to a common meeting point called the "parting pens". Here all the sheep were put into one pen and the lambs separated from them. The ewes were then placed in a pen with the lambs. When the lamb recognized its mother, the two were caught and the lamb given the owners mark and put into the pen of the owner. The individual flocks were then driven to the farm of each owner and shorn of their wool. Flocks of sheep generally grew slowly as frigid winters took its toll. Many lambs died in the spring from exposure after birth. When turpentine stills were active in the area, the dogs of the turpentine workers roaming the forest, as well as wild hogs ate many young sheep. Eagles were troublesome to the farmers until they were nearly hunted to extinction. The wool produced in coastal Mississippi was classified as "Lake" wool. It brought a higher price than wool produced in counties further north as manufacturers considered it the very best. Septuagenarian, Bernard Basque, who still resides on the family farm north of Fort Bayou, recently shared some of his childhood experiences concerning sheep husbandry. He remembers well the spring when the ewes gave birth to a lamb. Twins were rare. The lamb remained with its dam for about six months. Merino rams were bought in Texas for breeding purposes. After shearing the sheep with manual shears, their wool was packed for market. A man would stand in a tall burlap bag and compress the wool by hand. When complete the wool bales would weigh two-three hundred pounds. In the early days, the wool was sent to Ocean Springs by wagon when the Davis Brothers were still active in the business. By the 1930s, merchant, Cliff Dees (1886-1963), at Vancleave, was the area wool broker. Bernard Basque recalls to well the day his father, Joseph Basque (1892-1978), drove two thousand head of sheep to the farm of Albert White located north of Vancleave. He walked the entire distance herding the stray animals. Bernard relates that there were no "chuck wagons" on these sheep drives. Their family mark was "under square, under slope". The Basque family had several uses for their sheep besides the commercial wool. The mutton was often eaten as a stew, baked, or fried. When a new baby was born into the family, the hide of a freshly slain sheep was stretched and dried. This sheepskin functioned as comfortable bedding for the youngster. Mrs. Basque and other women would card the wool into 4" x 6" squares called "batts". The batts were sewn between two layers of cloth and a warm quilt was created for bedding. The history of sheep and wool in this area cannot be traced to the early Colonial years. In April 1699, when d'Iberville (1661-1706) landed at present day Ocean Springs to build Fort Maurepas, he recorded in his journal the following: "my longboat brought from the cows that belong to Surgere and me. We brought them from France. All those I got in St. Domingue (Haiti) died, three on board the Francois, one on the Marain, and four on the island where they had been placed (Ship Island?). Most people say it is the cold weather, although it has not been cold". A few days later, the Frenchmen brought hogs and a bull to Fort Maurepas. No sheep are mentioned. 25 ewes, 2 years old in April to lamb 15 January to 15 February by a $200 imported Spanish buck. all times from his large flock as well as my own. Ocean Springs being the nearest railhead became a regional center for the buying and shipping of raw wool from the ranchers north of Fort Bayou. Woolmarket on the Biloxi River assumed this role at Harrison County. The coastal schooner was the vehicle for transport at that riverine village in Harrison County. In 1882, the family of Thomas W. Grayson (1825-1904) came to Ocean Springs from the Woolmarket area. Grayson operated a mercantile store on the Biloxi River in the SW/4 of Section 32, T6S-R9W. This site later became known as Stiglet's Landing when Joseph M. Stiglets (1852-1924) purchased it from Dr. David M. Dunlap (1803-1884+) in November 1884. Thomas W. Grayson is believed to have given the name "Wool Market" to the area since sheep and wool production prospered in the neighborhood. Grayson served the people of Ocean Springs as its fourth mayor (1897-1898). He was also Justice of the Peace here. His son-in-law, D.D. Cowan (1850-1929), was the first mayor of Ocean Springs (1893-1895) and also Superintendent of Education for Jackson County (1896-1905). The people of Back Bay (D'Iberville) got their wooden bridge to Biloxi in August 1901. It replaced an intermittent ferry system, which had been in established by the Board of Police of Harrison County in August 1843. Coincendentally, the first bridge to span Fort Bayou was dedicated in December 1901, replacing the Franco-Earle-Carver ferry which connected Ocean Springs to the wool country. The Davis Brothers, who operated a large mercantile store on Washington Avenue, were the leading brokers of wool at Ocean Springs. As early as 1891, George W. Davis (1842-1914) and Elias S. Davis (1859-1925) were purchasing wool from local farmers. When the shearing season closed in June of 1892, they had shipped over 60,000 pounds for which they paid about $14,000 ($.23 per pound). In June 1909, the Davis Brothers of Ocean Springs shipped about 1200 pounds of wool to the H. Piser & Co. of Mobile. They expected about 20,000 pounds to be marketed in the next week and consigned to the Mobile firm. This was the remainder of the remarkable wool purchase made by H. Piser & Co. sometime ago at the top notch price of 31 1/2 cents per pound. In late August 1910, L.M. McClure & Company paid local stockmen 21 ½ cents per pound for their wool. On September 22, 1910, the Metzger Brothers of Mobile bought 18,000 pounds of wool for 21 1/2 cents per pound. During the past three weeks nearly 40,000 pounds of wool were sold at Ocean Springs. Sardin Ramsay, one of Jackson Counties most substantial farmers and sheep owners, was in town to market his wool, probably the 18,000 pounds. L.M. McClure & Co. were local agents for Metzger Brothers. Sardin G. Ramsay (1837-1920) was a farmer and large landowner. The Ramsay tract consisted of several thousand acres of land in southeast quadrant of T6S-R7W. It was located southeast of the present day intersection of Highway 57 and the Gautier-Vancleave Road. H.D. Money (1869-1936), who was the proprietor of the Rose farm north of Fort bayou, was also a proponent of sheep raising. Colonel Money had fruit and pecan orchards on his large farm. In September 1915, Money reported to The Ocean Springs News that his experience with sheep raising, although on a small scale, was very profitable. He related the following about his experiences: The fertilizer benefits they did those orchards is almost unbelievable. From scanty and unsatisfactory appearance, the trees put on a deep and healthy green. The nut yield is large. The sheep found abundant to eat-nothing was planted there-only the natural grass supported them. In keeping the weeds down, they saved me the expense of cultivating as well. During the final years of World War I (1914-1918), the price of wool and mutton again increased dramatically. By October 1917, the price of wool reached $.60 per pound nearly doubling pre-War prices. Mutton cost the consumer $.17 per pound at this time. These inflated prices caused speculators to seek immediate investments in the sheep industry because of its high profit potential. At Ocean Springs, Newton Jones, a native of Columbus, Ohio, who came here in 1913, and bought Field Lodge, the home of Mary Florence Field at East Beach for $15,000, was one of these entrepreneurs who attempted to take advantage of the wool boom of the late War years. Mrs. Field was living at Nice, France when she sold her thirty-three acre estate to Jones. Here on the Cote d'Azur in 1914, she met Chevalier Scovel, the great tenor. They married and resided in Paris at the Villa Spontini. Field Lodge burned in the 1960s. In October 1917, Newton Jones bought 1200 acres in the northwest Latimer area from Anna Orrell and the heirs of Christopher Columbus Orrell (1832-1906), a turpentine operator and native of North Carolina, who settled here from Alabama. Here in Sections 21, 27, and 28 of T5S-R9W, he founded the Jackson County Sheep Ranch. The sheep ranch of Jones was located primarily in Harrison County straddling the Jackson County line about twelve miles north of Ocean Springs. It was fenced. In order to stock his ranch, Jones received a shipment of two hundred sheep from Bayou Sara, Louisiana in October 1917. Only one animal died in the relocation effort. The animals were driven from the L&N depot at Ocean Springs to his rural sheep ranch. In an October 1917, interview with The Jackson County Times, Newton Jones said: Sheep suffer from the lack of attention just like a growing crop, and for the best results to follow, one has to give them attention, or the enterprise becomes a failure. In addition, Newton Jones said "that the average sheep grown in this territory weighed but 40 pounds at maturity, whereas lambs attained that size in the west in four months. This difference is the result of neglect on the part of those engaged in raising sheep, and they can be produced here of equal value to those in the west". He planned to demonstrate that they could. At the time during the Fall of 1917, a son of Newton Jones, Sergeant La Berne Jones, was serving in the Ohio artillery camped at Montgomery, Alabama. Newton Jones had a partner in the Jackson County Sheep ranch. He was Dr. Fitch who also came here from Ohio. Fitch officed in the Farmers and Merchants State Bank Building. He replaced Dr. Henry B. Powell (1867-1949) who went to Camp Shelby with the 139th Field Artillery as a Captain in the Medical Corps. October 1917-Two hundred sixty head of sheep were shipped to Fort Worth, Texas by land owners north of Fort Bayou. Price was $3-$4 per head. December 1917-The Southern Pine Association met at New Orleans to discuss the possibility of the large sheep flocks of the Western ranges relocating to the cut-over and timbered pine lands of the South. The western ranchers were restricted by recent homesteading of public lands there. These wool growers were seeking grazing lands for their large operations. June 1919-A big wool sale of over 75,000 pounds at $.58 per pound was made in the area. May 1924-Joe Basque (1892-1978) who lived north of Ocean Springs shipped 1000 head of sheep to Ohio. The price was $3.00 per head. June 1924-Two carloads of wool were sold to a Mobile broker for $.40 per pound. The market had just dropped below this price. June 1925-W.H. Westfall (1874-1939) and other merchants in the Vancleave area handled over 23,000 pounds of wool which was marketed at Ocean Springs at an average price of $.50 per pound. J.C. Harvey of Mobile bought the entire shipment. June 1926-A quarantine order stopped movement of sheep in nine Mississippi counties, including Jackson. Sheep scabies, a communicable disease caused by mites, was the problem. Only dipped and disease free animals could be shipped. Several carloads of sheep were dispatched from Ocean Springs via dipping the vats at Hattiesburg. Mrs. Mary Doyle Krohn (1860-1944), former postmistress at Latimer and widow of Fred Krohn (1859-1918), sold 679 sheep to northern interest at $3.00 per head. August 1927-During the past six weeks, Mr. R.J. Sously of Ocean Springs shipped over 6000 head of sheep to various parts of Kentucky, Tennessee, and Missouri. 2000 head were from the Krohn farm across Fort Bayou. The decline of commercial sheep raising north of Fort Bayou can be traced to the passage of Chapter 263-House Bill No. 91 by the Mississippi legislature in 1926. The stock law was passed to prevent all live stock (cattle, horses, mules, jacks, jennets, sheep, goats, and hogs) from running at large upon open or unfenced lands. Animals were restricted to a safe enclosure. The statue also sought to prevent the spread of Texas fever ticks. In 1930, Bonnett v. Brown (No. 28288) tested the stock law in the Supreme Court of Mississippi. The original suit had been filed at George County. Another crushing blow to sheep husbandry in the area was the 1934 screw worm epidemic. It did serious damage to regional flocks and almost destroyed the sheep industry at Jackson County. Sheep are still raised in Jackson County today albeit their numbers are small. Now, wool fetches about $1.92 per pound as compared to $.50 per pound seventy years ago. In a comparable time period, land values in the outback Fort Bayou region have soared from $4.00 per acre to upwards of $1,000 per acre. The moral-raise land not sheep. Ray L. Bellande, "Stiglets Landing", (unpublished essay), August 1995, p. 1. Regina Hines Ellison, Ocean Springs, 1892, 2nd Edition, (Lewis Printing Services: Pascagoula, Mississippi-1991), p. 45, p. 55, and p. 59..
Facts About The Gulf Coast of Harrison County, Mississippi, (Reprint-Harrison County Publishing Company Ltd.-Gulfport, Mississippi-1985), pp. 13-14. General Laws of the State of Mississippi, Chapter 263, (Tucker Printing House: Jackson, Mississippi-1926, pp. 374-375. Jackson County WPA, p. 308. Southern Reporter, "Bonnett v. Brown" (No. 28288), (West Publishing Company: St. Paul, Minnesota-1930), pp. 427- 429. Jackson County, Ms. Record of Marks and Brands Book 2, pp. 12-13. Minute of the Board of Police of Harrison County, Mississippi, Book 1, p. 42. The Biloxi Herald, "A Bridge Needed", July 23, 1898, p. 2. The Biloxi Herald, “Ocean Springs”, June 27, 1891. The Biloxi Herald, "Ocean Springs", November 8, 1890, p. 4. -------------------, "Ocean Springs", June 25, 1892, p. 1. -------------------, February 21, 1899, p. 8. The Jackson County Times, "Local News Interest", June 30, 1917. --------------------, "Jones Sheep Ranch Attracts Attention", October 6, 1917, p. 5. --------------------, "Local News Interest", October 3, 1917. --------------------, "Local News Interest", October 20, 1917. --------------------, "Local News Interest", November 3, 1917. --------------------, "Western Sheep Owners May Bring Flocks To South Mississippi", December 15, 1917, p. 1. --------------------, Local and Personal, June 28, 1919. --------------------, Local and Personal, May 31, 1924. --------------------, "Farmers market two carloads of wool at Ocean Springs", June 28, 1924. --------------------, Local and Personal, June 13, 1925. --------------------, "Shipments of Sheep Stopped by Quarantine", June 5, 1926, p. 1. --------------------, "Local and Personal", August 6, 1927. ------------------, "Local News", September 24, 1910. ------------------, "Wool Shippers Want Autos", July 8, 1915, p. 1. ------------------, "Hundred Per Cent Profit", September 30, 1915, p. 1. The Pascagoula Democrat-Star, "Sheep raising near the Gulf Coast", August 2, 1878, p. 1. The Pascagoula-Democrat Star, "W.R. Stuart advertisment", November 22, 1878, p. 4. The Pascagoula Democrat-Star, “Ocean Springs Items”, July 11, 1879. The Pascagoula Democrat-Star, “Ocean Springs News”, June 12, 1891. The Pascagoula Democrat-Star, “Ocean Springs Locals”, June 4, 1897. The Pascagoula Democrat-Star, “Ocean Springs Locals”, May 18, 1900. The Pascagoula Democrat-Star, "New Bridge Across Fort Bayou Opened", December 13, 1901. Bernard Basque-March 1996 and July 1996. Although the early European explorers and adventurers failed to find gold and other mineral wealth in the strata of the Gulf Coastal plain of the southeastern United States, there was indeed an inestimable natural treasure in the guise of virgin forests which waited to be exploited. In particular, from this verdant expanse was the longleaf pine. This evergreen conifer is also called the southern pine, heart pine, yellow pine, and long straw pine. The longleaf pine often grows to a height of 95-100 feet with a diameter of three to three and one-half feet. It is characterized by rising 60-feet without a single branch before expanding into its evergreen crown. The longleaf pine belt extends over 1500 miles from southeastern North Carolina, through South Carolina, Georgia, Florida, southern Alabama and Mississippi, and stretches into portions of Louisiana and east Texas. In Mississippi, most of the longleaf were built to process lumber for export to their Caribbean island possessions. In addition, naval stores, which once included hemp, flax, masts, spars, planking, tar, and pitch, but by 1800, referred only to tar, raw turpentine and their by-products: spirits of turpentine, rosin, and pitch, were a product of our local forests. When Thomas Hutchins (1730-1789), who was named Geographer to the United States in 1781, had visited the Mississippi coast in 1784, he made the following observation: There are still a few inhabitants at Biloxi, some of whom are the offspring of the original settlers. Their chief employment is raising cattle and stock, and making pitch and tar. Tar is made by firing pine logs and branches in slow-burning kilns. Pitch is derived from boiling the produced tar. Both are used for nautical functions. Tar was applied on the rigging and ropes of ships to reduce rot while pitch was painted on to the bottoms and sides of wooden vessels to prevent leakage. Before the early 19th century, spirits of turpentine, the distilled resin, and rosin, the residue of distillation, had few uses. Between 1805 and 1830, the American naval stores industry, which centered primarily near Wilmington, North Carolina, saw tar and pitch production gradually decrease while the harvesting of crude turpentine and the manufacturing of spirits of turpentine increase in response to demands from new sources. In particular, the rapidly developing rubber industry, soap manufacturers, and consumers of camphene sped the production of spirits of turpentine. Most of the new demand was from camphene users. This popular luminant, which became widely used commencing in the 1830s, is also known as camphine, Teveline, and palmetto oil. It is a mixture of turpentine and alcohol. Camphene remained the most economical form of illumination for homes, hotels, and city streets until 1860. Large scale production of kerosene developed from the shallow oil produced in western Pennsylvania supplanted camphene as a lighting source, and the American petroleum industry was born. Turpentine production combines agricultural and industrial disciplines. The raw harvested product called resin or gum is the sap of conifer trees, usually either long leaf or slash pine. The resin flows only in warm weather months commencing in mid-March and peaking in late July. By November or the first frost, the sap gathering season ends. The forest area where the raw gum is harvested is called an orchard. Here families, predominantly Black Americans, supervised by a woods rider, lived in isolated shanty camps. The black workers were employed by a company or individual who either owned or leased the land that was worked for rosin and turpentine production, "the crop". Turpentine workers were paid in cash or company minted currency or tokens, scrip, commissary check, or credit chits, which were utilized at the commissary or company store. The metal tokens were called "brozines", "light money", or "jugaloo". The commissary supplied the turpentine worker with basic food staples, clothing, tools, and ancillary items such as, tobacco, snuff, matches, castor oil, and kerosene. A church and school building were generally part of the turpentine camp. Teachers visited several camp schools during the week. Although six grades were provided, many children began working in the orchard at age seven to ten years as dippers, i.e. laborers who collected crude gum from the trees. Saturday was a day of celebration for the camp workers. A meal of fresh pork and "corndodger" was followed by a dance on Saturday night. This was ensued by an all night crap game or card game called "skin" held by the light of a pine knot fire. It was not unusual for "hustlers" to visit the turpentine camp around payday. Their purpose was to win the hard earned earnings of the workers in games of chance. An incident occurred in July 1911, at the Fort Bayou Turpentine Company camp when the body of Clarence Whistlehunt, a gambler, was found floating in Fort Bayou. Several blacks were held in the Pascagoula jail for allegedly murdering him. (The Ocean Springs News, July 1, 1911). It is interesting to note that several local turpentine operators held patents on turpentine cups and appurtenances. Alabaman, Lee Vernon Pringle (1866-1938), who relocated to Biloxi from Jackson County in 1908, invented the Pringle Cup, a clay device. It was manufactured at Daisy, Tennessee. L.D. Byrd (1876-1931), also of Biloxi, in 1905, patented the Byrd Cup, a metallic basin, to collect crude gum. The operation to remove raw turpentine from the box was called dipping. The dipper was a tool with a spade-shaped blade and handle. The worker usually a black woman or black child collected gum by pushing the dipper into one end of the box, pushing it to the bottom, and bringing the sticky contents of the box up to the opposite side-all in one rapid motion. Workers were expected to fill from four to seven barrels with raw turpentine per day. The full barrels were collected by teamsters and carried in wagons to the still for distillation. The fire still was the center of the turpentine camp. It was flanked by the commissary or general store and the shanty cottages of the workers. The fire still generally had capacity ranging from 15 to 25-barrels of pine gum. The distillation process yielded three barrels of turpentine and 12 barrels of rosin in eight hours from twenty barrels of pine gum. The early barrel contained 31.5 gallons but later increased to 50 gallons. Cooperage or the art of barrel making was an integral part of the turpentine operation. One fifth of the men engaged in turpentine production were coopers. They produced oaken, pine, and hickory turpentine and rosin barrels and appurtenances such as, staves, heading, truss hoops, and barrel hoops. Most coopers were black and received higher wages than the average woodworker. As the naval stores industry rapidly expanded in the late 19th and early 20th Century, financing for field operations was provided by factorage houses. Investment capital for a turpentine operation was essential as the following requisites existed to function in the industry: acquired or leased timber land; fire still and ancillary equipment and cooper shed; structures for workers and their families; transportation vehicles, such as trucks, live stock teams, and wagons; tools and equipment for woods working operations such as, chipping and dipping tools, buckets, barrels, cups, and gutters; and a well- stocked commissary. Only a small percentage of individuals or turpentine companies had the necessary capital to finance their own field operations. Commercial banks were negative about lending money to finance naval stores operators because the risk was deemed high. The assets of the turpentine operator were mostly intangible and of almost no value as collateral. The void to capitalize the turpentine industry was filled by naval store factors. Factorage houses were agents or companies acting for a fee in several capacities. They might finance the owner or lessee of a turpentine operation and provide the materials and tools, manage the operations or act as agent in marketing the gum. The factor could also act as a commissions merchant, wholesale grocer, and dealer in supplies. Factorage house were located at Charleston, Soth Carolina; Brunswick and Savannah, Georgia; Jacksonville and Pensacola, Florida; Mobile, Alabama; and New Orleans. Taylor-Lowenstein & Company of Mobile and the Union Naval Stores of New Orleans were active factorage houses operating in Jackson County, Mississippi in the early decades of this Century. The development of the central still in the 1930s, allowed gum producers to sell pine gum rather than turpentine and rosin produced from their own still. Since the operator appreciably reduced his costs by shutting down his fire still and associate cooperage activities, he became less dependent on the factor. By 1950, the factorage system of financing and marketing was essentially over. 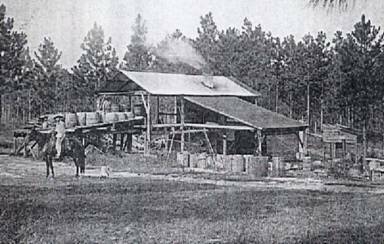 The gum turpentine industry in the longleaf-slash pine belt of the South today is very small compared with former times. Georgia produces about 87 per cent of the USA production which amount to only 3 per cent of world production. China produces about 50 per cent of the global gum turpentine supply. The USA and Canada lead the world in the production of sulfate turpentine, which is a by-product of kraft paper production. They produce about 69 per cent of the global production of sulfate turpentine. Another source of turpentine today is wood turpentine, which is produced by steam distillation of waste wood and sawdust. Dead stumps from the original longleaf pine forests were the original source of wood turpentine. The Yaryan Naval Stores Company built the first steam and solvent distillation plant in the world at Gulfport in 1909. It processed primarily lightwood stumps. Before 1950, almost all turpentine was used as a solvent for paint and varnish. Competition from water-miscible paints and low cost petroleum solvents forced turpentine retailers to find new markets for their products in the rubber, plastic, and industrial applications sectors of the American chemical industry. In A Voice Crying in the Wilderness, the author, Jacob Reddix (1897-1973), whose grandfather, Henry Galloway, was one of Thomas Galloway's slaves brought from North Carolina, states that slaves, Abram and Henry Galloway, built and operated the turpentine distillery for Galloway, and later constructed the first sawmill in interior Mississippi. It is interesting to note that Thomas Galloway had a black or mulatto wife. Her name was Harriet Ann Galloway and was a former slave. In March 1879, almost five years after Thomas Galloway's demise from yellow fever on October 4, 1874, his wife sued John E. Clark, the administer of his estate, in the Chancery Court of Jackson County. In the legal proceedings, Mrs. Galloway related that she married Galloway in North Carolina in 1855. They relocated to South Carolina and them moved to Jackson County, Mississippi circa 1862. Four children were born to the couple at Jackson County: Joanna Moore Galloway (b. 1866), Mary Eliza Galloway (b. 1868), Sophia Pauline Galloway (b. 1870), and Rachael Frances Galloway (b. 1873). (JXCO, Ms. Chancery Court Cause No. 53-March 1879). Thomas Galloway died intestate. He was a wealthy man and had an estate consisting of a homestead, storehouse, 800 acres of land, and $20,000 in cash. The court denied his family these assets because of their skin color. Caroline Taylor, an old slave, related to WPA workers in 1939, that Bob Burney with a number of slaves he brought from North Carolina, established a turpentine still at Vancleave on the east bank of Moungers Creek. It appears that turpentine production continued in Jackson County for a few decades after the Civil War as small family run operations. Circa 1880, the western Jackson County turpentine industry began in earnest with the arrival of the John C. Orrell and Christopher C. Orrell families who came from western Alabama probably the State Line area. Like most pioneer turpentine people, the Orrells were originally from the "Tar Heel State", North Carolina. John C. Orrell (1830-1917) was born in February 1830, at North Carolina. His children were: John C. Orrell Jr. (1862-1917+), Albert L. Orrell (1867-1937), and Christopher Orrell (1872-1900+). Albert and Christopher Orrell were born in Alabama. John C. Orrell owned thousands of acres of pinelands in Jackson County. In November 1885, he donated 6 acres in the NW/4 of the SW/4 of Section 19, T5S-R8W to the New Prospect Camp Ground north of Vancleave (JXCO, Ms. Land Deed Bk. 7, pp. 597-598). Later in October 1904, Orrell sold the Trustees of the Methodist Episcopal Church South-Seashore District, W.W. Broom, J.H. Havens, D.G. Alexander, W.K. Ramsay, S.R. Ratliff (1873-1936), T.E. Ramsay (1845-1934), S.G. Ramsay (1837-1920), and T.Q. Roberts, forty acres being the NW/4 of the SW/4 of Section 19, T5S-R7W for $260. (JXCO, Ms. Land Deed Bk. 28, pp. 631-632). J.C. Orrell died at Mobile, Alabama on November 29, 1917. His obituary in The Mobile Press Register relates that his remains were interred at Kipling, Alabama. Orrell left 4040 acres of land in T5S-R7W, T5S-R8W, and T6S-R8W of Jackson County, Mississippi to the following legatees: Nattie J. Adams (Mobile), Maggie L. Pierson (New Orleans), Desiree O. Clarke (New Orleans), John C. Orrell Jr. (Mobile), and Albert L. Orrell (Vancleave). (JXCO, Ms. Land Deed Bk. 48, pp. 157-160). John C. Orrell Jr. (1862-1917+) was born in Alabama. He married Sallie Grayson (1865-1917+), the daughter of Ocean Springs mayor, Judge Thomas W. Grayson (1825-1904) on November 24, 1889. They resided at Ocean Springs in 1892. By 1900, the Orrels had four children with three daughters surviving: Lillian Orrell (1892-1900+), Lucille Orrell (1893-1900+), and Irene Orrell (1898-1900+). J.C. Orrell Jr. worked as a baggage master for the L&N Railroad in 1900. The J.C. Orrell Jr. family moved to Mobile and were residing at 208 State Street in Mobile in 1917, at the time of father's demise. Albert L. Orrell (1867-1937) was born at Alabama. He married Ida Ramsay (1873-1920+) of Fort Bayou on September 26, 1900. Her father was Sarden G. Ramsay (1837-1920) and step-mother, Lula Hill Ramsay (1861-1949). In 1900, Orrell was a turpentine operator, but later got into farming on his homestead in the NE/4 of section 29, T6S-R7W. Christopher C. Orrell (1832-1906), and Sidney Orrell (1901-1908+). The Orrell family appears to have come to Jackson County, Mississippi from Alabama between 1882 and 1884. The Orrell family eventually settled at Florala, a village, north of the Latimer community in western Jackson County. At this time, Florala had a post office, store, school, and turpentine still. C.C. Orrell may have operated what was known as the Double Still which gave its name to the present day road, north of Latimer. Christopher C. Orrell died intestate on August 28, 1906. His remains were interred in the White Plains Cemetery at Harrison County, Mississippi. After C.C. Orrell's demise, a forced heirship suit, Cause No. 1661-Mrs. Anna Orrell, el al v. Toler Orrell, was filed in March 1908, in the Jackson County, Mississippi Chancery Court. A court appointed commission composed of T.E. Ramsay, Wesley Cox, and Albert L. Orrell divided the C.C. Orrell Estate into twelve shares of equal value. Names and numbers were drawn lottery style and two thousand acres in T5S-R9W and 800 acres in T6S-R9W were awarded. The twelve parcels ranged in size from 200 to 280 acres. An additional 450 acres in the southern area of T3S-R7W, which is now in George County, was sold and the proceeds distributed to the heirs. Patrick H. Orrell was probably the son of John or C.C. Orrell. He married Eugenie Lewis (1850-1932), the daughter of Alfred E. Lewis (1812-1885) and Ann R. Farrington (1821-1901), the builders of Lewis-Sha at Gautier, which today is known as Oldfields. The P.H. Orrells were the parents of two children: Maud Mary Walton Orrell (1875-1875) and Edwin DeVendel Orrell (1876-1940). In her later life, Mrs. Eugenie Orrell owned and resided at present day 405 Ward Avenue in Ocean Springs. Simpson & Vizard was owned by principals, John F. Simpson (1841-ca 1895) and Anthony Vizard (1837-1908). They established themselves as dealers in rosin and turpentine in 1872. Simpson & Vizard were the successors of Emmanuel Blessey, who established the business many years before the Civil War. John F. Simpson was born at New Orleans in 1841, the son of A.P. Simpson of South Carolina and Adelia Forsyth. Her father, Captain James Forsyth (1773-1867), ran boats between New Orleans, Mobile, and Pensacola. In 1819, A.P. Simpson established himself at Pensacola in the lumber milling business. He relocated to New Orleans in 1834, and became the largest dealer of lumber in the city. John F. Simpson was educated at New Orleans. During the Civil War, he served with Dreux's Battalion, the 14th Louisiana Infantry, and the Pelican Battery. At New Orleans, Simpson was a director of the board of trade and a member of the Varieties and Southern Yacht Club. J.F. Simpson married Athalie Bourcier (d.1937), a New Orleans native. They had no children. In addition to his naval stores interests with Vizard, J.F. Simpson was a merchant. His brother-in-law, P. Bourcier, was a clerk in his store. Anthony Vizard (1837-1908) was born at Mayo County, Ireland. In the 1880 Federal Census, he was a lime merchant and resided at New Orleans in Ward 3. At this time, Vizard was a widower. His children were: Thomas Vizard (1863-1880+), William Vizard (1866-1880+), Cecelia V. Watson (1868-1931), Cora H. Davis (1870-1949), and Anthony Vizard Jr. (1872-1933). In January 1896, Athalie Simpson and Mrs. Adelia Forsyth, the sole legatees of John F. Simpson, sold their one-half interest in Simpson & Vizard to Anthony Vizard. (HARCO Land Deed Bk. 33, pp. 491-492). In Jackson County Chancery Court Cause No. 1118, Union Naval Stores v. Thomas F. Moore, filed January 1903, the defendant, T.F. Moore of Thomas County, Georgia, alleged that the Union Naval Stores Company with the exception of A. Vizard had a virtual monopoly on turpentine production in Mississippi. Another New Orleans company, the Fort Bayou Turpentine Company would become active north of Ocean Springs in late 1910. It was run by some of the same officers of the New Orleans Naval Stores Company. This New Orleans organization was formed by two men who were long associated with the New Orleans Naval Stores Company, Walter Boyer Gillican (1874-1954) and Buckner Chipley (1876-1945). W.B. Gillican was born at Wilmington, North Carolina. He was a graduate of the Cape Fear Academy. At New Orleans, Gillican was a member of the Boston, Pickwick, Louisiana, Southern Yacht, and Delta Duck Clubs. His partner, Buckner Chipley, was a native of Louisville, Kentucky. He graduated from the University of Virginia and had a career in commerce. Chipley in addition to his vice-presidency of the Gillican-Chipley Company, was a director of the Whitney-Central National Bank and the Pan American Life Insurance Company. Socially, Chipley was active in the following clubs: Boston, Louisiana, New Orleans Country, Press, and University. He was married to Anita Galt (1874-1954). In addition to the turn of the Century naval stores operators from New Orleans, a small contingent of men active in the business in the central Florida and its western panhandle, also became operative in Jackson County. About this time, two gentlemen, M.O. Starling and H.L. Covington, formed the Ocean Springs Turpentine Company. They resided at Pensacola, Florida. H.L. Covington was president of the Gulf Naval Stores Company, which had offices at Pensacola and Tampa. His company was amalgamated in September 1902, with six other regional factorage houses to form the Consolidated Naval Stores Company. They also maintained an office at Pensacola. In the summer of 1906, the Ocean Springs Turpentine Company began to operate in Jackson County, Mississippi, when M.O. Starling took a lease on the NW/4 of the NW/4 of Section 22, T7S-R8W from H.F. Russell (1858-1940). It was a ten year turpentine lease commencing on December 1, 1906. (JXCO, Ms. Land Deed Bk. 31, pp. 292-294). Here on Fort Bayou at a site near Nobles Landing, the Ocean Springs Turpentine Company operated a twenty-barrel turpentine still. The surroundings of the still must have been quite beautiful and conducive for social outings and picnics as described by the local journal, The Ocean Springs News. On January 20, 1911, H.L. Covington and John M. Memory sold a one-third interest in the company to W.L. McWhite. The sale took place at Escambia County, Florida. (JXCO, Ms. Land Deed Bk. 36, p. 374). The Ocean Springs News corroborated this conveyance when it announced that Gilligan, Vizard, and Payne bought over 6,000 acres of pine and cutover land from George Rose of New York City for $35,000. The same journal reported on December 24, 1910, that the Fort Bayou Turpentine Company planned to divide two thousand acres of their property into smaller parcels from ten acres up and sell them to small farmers and fruit growers. The remaining acreage would be retained for turpentine operations. Payne planned to plant pecans and oranges on one forty-acre tract. He was also contemplating a move to Ocean Springs. In his real estate and naval stores business, John F. Payne's word was his bond. During his lifetime, Mr. Payne amassed a small fortune in corporate bonds which he legated to his family. (HARCO Will Book 6, pp. 240-247, Estate No. 11,324). J.F. Payne was a Methodist and member of the Long Beach Blue Lodge as well as a 32nd degree Scottish Rite Mason at Gulfport. A strong believer in education, Payne sent daughter, Eleanor, to the American University at Washington D.C. He was also one of the promoters of Gulf Park College. John Franklin Payne expired at Long Beach on October 27, 1929. Mrs. Payne moved to Gulfport, Mississippi. She passed at her Bayou View home on January 27, 1959. They are interred with their daughter, Donnie P. Hartley, in the Evergreen Cemetery at Gulfport. In 1910, Robinson operated a turpentine orchard and fire still, most probably in Section 8, T7S-R7W, east of Ocean Springs. There is a high degree of certitude that present day Robinson Still Road is named for this man. In September 1904, Robinson had taken a three year turpentine lease in this area, Sections 2-11 of T7S-R7W, from Dr. Harry Shannon and his wife, Lucy I. Shannon. (JXCO, Ms. Land Deed Bk. 29, pp. 142-143). The 1910 Federal Census of Jackson County indicates that Robinson's workmen were black and mulatto. They included: distiller, William B?son (b. NC-1863); cooker, Hayne McCoy (b. NC-1882); dippers, Abram Sutton (b. NC-1875), Henry Lacy (b. GA-1878), Will Washington (b. NC-1878), and Henry McCarty (b. ALA-1891). Charles Brooks Elarbee (1861-1917) was born February 26, 1861 at Waycross, Georgia. He came to Biloxi in 1903. Elarbee was engaged in the turpentine business in Harrison and Jackson Counties primarily with D.J. Gay. They operated as Gay & Elarbee. In 1906, his Ocean Springs Naval Stores Company consisted of D.J. Gay, C.B. Elarbee, and George Robinson. Daniel Judson Gay (1870-1949), the son of John W. Gay and Salida Lanier, was born in Emanuel County, Georgia, which is governed from Swainsboro. He came to Biloxi in 1902, from turpentine operations in Florida. Gay married Lee B. Champlin (1884-1964) on December 8, 1903. She was the daughter of Judge Zachary Taylor Champlin (1847-1924) and Virginia White Champlin of Handsboro. Their other children were: William Henry Champlin (1870-1931), Maggie Champlin, Nellie Champlin, and Walter Champlin. The children of D.J. Gay and Lee B. Champlin were: Louise G. Dantzler Duncan (1904-1975+), Daniel J. Gay Jr. (1906-1964+), John C. Gay (1909-1975), Edna G. Jenkins (1910-1975+), and Katherine G. Farrar (1915-1975+). D.J. Gay taught school and was in the naval stores, banking, and realty business. In 1905, Gay organized and was president of the Harrison County Bank of Biloxi. It merged with the Peoples Bank in 1914. D.J. Gay was president of the Peoples Bank for a number of years before the O.G. Swetman began the long reign of that family in banking at Biloxi. The Gay family resided at Biloxi on the Beach east of the Dantzler House. They later lived on the Tchoutacabouffa River and at Ocean Springs, Mississippi. D.J. Gay was locally involved in the naval stores business operating turpentine operations in Harrison and Jackson Counties. His first partner was fellow Georgian, Charles B. Elarbee (1861-1917). Gay later worked with George L. Robinson (1848-1919+) and Robert W. Hamill (1863-1943) of Chicago. His son, J. Champlin Gay, and brother, Edward C. Gay, also were associated with Gay in the turpentine business. It is believed that E.C. Gay residing at San Antonio, Texas ran the family turpentine operation near Durango, Mexico between 1927 and 1932. D.J. Gay was a philanthropist. In December 1926, he donated land for the erection of the public high school on Government Street at Ocean Springs. In March 1945, Gay also donated ground for the Triumph Church west of Denny. (JXCO, Ms. Land Deed Bk. 88, pp. 495-496). In May 1926, D.J. Gay platted the Forest Hills Subdivision at Ocean Springs. It is located in the NE/4 of Section 30, T7S-R8W, and include the home of Mrs. W.R. Stuart. (Plat Book 1, p. 92). Lee Vernon Pringle (1866-1938) was a native of Semmes Chapel, Mobile County, Alabama. He was born February 28, 1866, the son of Frank M. Pringle and Corinia Yonge (1845-1920). L.V. Pringle came to Biloxi in 1908, probably from Latonia, Jackson County, Mississippi where he was associated with the Latonia Turpentine Company and Union Naval Stores of Mobile. These organizations were naval stores manufacturers and dealers in general merchandise. In 1901, Pringle served as postmaster at Latonia, which is about 12 miles northwest of Semmes Chapel, Alabama. Mr. Pringle invented a turpentine cup, which was manufactured by the Pringle Cup Company in Daisy, Tennessee. In 1902, the Chattanooga Pottery Company of Daisy, Tennessee was formed by the Consolidated Naval Stores Company, to manufacture clay cups. Consolidated Naval Stores was formed by the merger of seven Florida and Georgia factorage houses also in 1902. They had offices in Savannah, Jacksonville, and Pensacola. It is very probable that the Pringle Cup Company was a name only and that the clay cups were manufactured by the Chattanooga Pottery Company. In addition to his naval stores operations in Mississippi, Mr. Pringle had turpentine and rosin at Florida, Alabama, and Louisiana. He was vice-president of the Gillican-Chipley Company of New Orleans for fifteen years and held the same position with the Pringle-Gay Turpentine Company. L.V. Pringle also had his own real estate company and held large personal land holdings. F.E. Pringle was highly lauded in May 1916, for the celerity in which he rebuilt the Jackson Naval Stores still at Florala. The fire still, located near the Florala Post Office, had been completely destroyed in a conflagration. Pringle brought in equipment and supplies from other company operations as well as sending damaged machinery to Mobile for repair. The Daily Herald of Biloxi said of Mr. Pringle's efforts, "this is the quickest work of its kind ever seen among turpentine producers in this section" (The Daily Herald, May 30, 1916, p. 8). F.E. Pringle developed the Pringle Subdivison at North Biloxi, now D'Iberville, which he acquired in February 1913. In 1922, he sold 2.12 acres at North Biloxi for the Methodist Church on Race Track Road. (HARCO, Ms. Land Deed Bk. 106, p. 285 and Bk. 130, p. 181). Robert W. Hamill (1863-1943) was born in Illinois, the son of Charles Davisson Hamill (1839-1905), a Hoosier, and Susan F. Waldbridge, from Ithaca, New York. He married Katharine B. Lyon at Chicago in 1892. Her father, John B. Lyon (1829-1904), was a very successful grain trader in the Windy City. In addition to his wheat and corn trading, Mr. Lyon managed sugar plantations in Louisiana, oyster production in Mississippi, and had timber and naval stores interests in Florida, Alabama, and Mississippi. R.W. Hamill began sojourns to Ocean Springs as early as 1905, to oversee the interests of the Lyon Company of his late father-in-law, John B. Lyon. Initially, Mr. Hamill rented upscale estates like the DePass Place (now Shearwater Pottery) or "Lyndhurst", the Thomas B. Lynd (1862-1915) Estate on Front Beach, now Alice Austin Martin, the daughter of Alice T. Austin. "Shadowlawn", the Hanson-Dickey home on Biloxi Bay, formerly a fine bed and breakfast inn owned by the Wilson family, was leased by the Hamills in 1915. In the summer and fall of 1915, it is believed that R.W. Hamill contracted with the Weider brothers, Joseph A. Wieder (1877-1960) and Philip J. Wieder (1887-1985), to erect a two-story edifice at Belle Fontaine Beach for his family which now consisted of: Robert Lyon Hamill (1899-1974), Katharine Frances Hamill (1901-1980), Emily H. Workum (1902-1979), and Frances Hamill (1904-1987). The Hamill family also maintained a large country estate at Clarendon Hills, DuPage County, Illinois, a suburb of Chicago. Here on the shoreline of the Mississippi Sound, Robert W. Hamill, was active in many commercial enterprises. The approximately 16,000 acre, Hamill Farm, which raised cattle and pecans, is well remembered by the older generations residing at Fontainebleau, Gautier, and Ocean Springs. Several buildings, tenant houses, and the old Hamill barn are extant near the Old Spanish Trail and Highway 57 juncture. In the longleaf pine belt of coastal Mississippi and southern Alabama, the Hamill and turpentine Company probably operated the Hilda turpentine camp west of Gautier in Section 34 or 35, T7S-R7W, which was taken over by Gay-Hamill and abandoned in June 1924. The Lyon Consolidated School at Hilda, which opened in February 1919, was built by the Wieder brothers of Ocean Springs on ten acres of land donated by the Gulf of Mexico Land & Improvement Company, which was represented by R.W. Hamill. It is believed that the name Hilda originates from Hilda Beasley, the wife of W.G. Beasley of Leesville, Louisiana. Mr. Beasley was an investor in some of the Lyon-Hamill naval stores operations and may have been the manager of the Hilda operations. The Gay Turpentine Company was incorporated in 1911, and domiciled at Larue. Robert W. Hamill was the president and Daniel J. Gay, the secretary-treasurer. Stockholders were: Lyon Company-60 shares; D.J. Gay-20 shares; R.W. Hamill-15 shares; Frank Matlock-3 shares; and W.G. Beasley of Leesville, Louisiana-2 shares. The Hamill Turpentine Company was organized in 1912, and domiciled at Latimer. Robert W. Hamill was the president and D.J. Gay, secretary-treasurer. Stock holders were: Catherine Lyon Hamill-51 shares; D.J. Gay-30 shares; R.W. Hamill-12 shares; Lyon Company-4 shares; and Frank Matlock-3 shares. The company was dissolved in May 1921. (Ex parte-Hamill Turpentine Co., JXCO Chancery Cause -No. 4186). After these interrelated companies dissolved in May 1921, the Gay-Hamill Company came into existence. The company was headquartered in the Gay Building on Lameuse Street at Biloxi. The Peoples Bank now owns and occupies this edifice, which was erected by D.J. Gay in 1913. John Champlin "Champ" Gay (1909-1975) ran the Ocean Springs operation of Gay-Hamill which included a commissary and workers' camp. Mr. J.D. Galloway was the stiller. It is believed that Gay-Hamill naval stores operation here ceased in the 1940s. After his turpentine career was over, Champ Gay became a very successful businessman and politician at Ocean Springs. He was elected Mayor in 1953, 1957, and 1965 and served the people of Ocean Springs for sixteen years as mayor or alderman. Leonard D. Byrd (1875-1931) like many naval stores operators was a North Carolina native. In May 1906, at Biloxi, he married Lucille Powell, who came to the Mississippi coast from Pensacola. The Byrds had five children between 1907 and 1925. In addition to his naval stores interests, Byrd was a shoe merchant operating in the Gay Building on Lameuse Street. In April 1905, he patented the Byrd Cup (No. 786,950, a metal, cone-shaped container of one quart capacity. It was manufactured at Mobile. L.D. Byrd left Biloxi in 1930 for Valdosta, Georgia. He expired and his remains interred here in November 1931. His widow married G.O. Dawson of La Porte, Indiana in September 1936. They planned to winter at Biloxi and summer in the Hoosier State. Luther Sylvester "Bud" Allen (1872-1949) operated with the F.V. Baldwin & Company owned by Fred V. Baldwin of Satsuma, Alabama. They operated a small fire still at Vancleave near the juncture of Poticaw and River Roads about 330 feet right of the Munger's Creek bridge. L.S. "Bud" Allen rode the woods on "Dr. C", a much feared horse. There was a commissary at the still and the camp was portable. Mr. Allen died on October 4, 1949. No further information. In addition to his other economic interests in the Vancleave area of Jackson County, Clifton L. Dees (1886-1963) operated a small fire still and turpentine operation at Vancleave. The still was located just south of the Dees home, which is now occupied by his daughter, Peggy Dees Plunk. Among Mr. Dees employees were: Marvin Ely, foreman and stiller; Willy Croom; Will Dunham; Ernest Ely; Horace Ely; Dave Jackson; Andrew Thomas; and Willy Ware. In the 1940s, Mr. Dees founded a naval stores cooperative located at Pritchard, Alabama known as the Turpentine-Rosin Company. John Mallard Flurry (1863-1925) and William Ross David (1869-1919) of the Daisy-Vestry area operated several naval stores operations in northeast part of Jackson County primarily in T3S-R8W and T4S-R7W. John M. Flurry in addition to his entrepreneurial skills in the timber and naval stores industry was a strong civic leader in Jackson County. He was a pioneer in the development of rural schools, and roads. Mr. Flurry served on the Jackson County School Board for more than twenty years and he was president of the Board of Trustees of the Daisy-Vestry Consolidated High School, which he helped found in 1906, for seventeen years. J.W. Flurry was a member of the Jackson County Board of Supervisors for several years. It was during his tenure on this body that he improved and graded the roads in the northwest area of the county. Mr. Flurry was married to Lucinda S. Walker (1865-1913). They were the parents of eleven children. After the demise of Mrs. Lucinda Flurry in January 1913, J.W. Flurry married Miss Minnie Gertrude Roberts of Vancleave. They had a daughter, Wanda May Flurry. In December 1912, J.W. Flurry sold Rufus S. Clark of Poplarville several turpentine leases and a five year lease on a dwelling house, barn and wagon shed, cooper shed, glue shed, spirit shed and fifteen shanties located in the NE/4, NE/4 of Section 4, T4S-R8W. (Deed Book 39, pp. 1-2). J.W. Flurry also operated as Flurry & O'Neil, a co-partnership, which one worth more than $100,000 at one time. This venture may have been more timber than naval stores oriented. William Ross David was born at Dead Lake in northern Jackson County. He had married Mary Carter (1873-1942), the daughter of William M. Carter (1821-1895) and Sarah Ann Davis (1850-1923), in 1897. They were the parents of five children: Elmon C. David (1898-1918), Edwina D. Haus (b. 1902-1940+), Estelle David (b. 1907), Upton S. David (1908-1993), and Lydean David (1909-1989+). The extant Davìs home was acquired on the Front beach at Ocean Springs from Carl T. Case (1888-1918+) and Edwina Lynd Case (1892-1918+). The David Home burned in December 1922, when owned by Charles Grady Parlin (1880-1940). It was rebuilt in 1923, and now owned by Alice T. Austin. James E. Lockard (1862-1951) was born at York, Sumter County, Alabama. He married Kate Thompson (1868-1954) of Oxford, Mississippi in 1893. They were the parents of six children: Lulie Mae Lockard (1894-1960), William E. Lockard (1896-1966+), Dr. James N. Lockard (1899-1966), Annie L. Lord (1901-1989), Amanda Lockard (1905-1908), and Jacob T. Lockard (1909-1998). J.E. Lockard and family came to the Vanclave area in 1901, from Lauderdale County, Mississippi, to work for the L.N. Dantzler Company. Circa 1912, he bought the old Flurry place west of Vancleave. J.E. Lockard left Dantzler and commenced his own business, a mercantile store, at the juncture of Poticaw Road and Highway 57, now Cole's Corner. Lockard utilized two trading schooners, the Excel and the Mabel Judlin, in his business enterprises. Mr. Lockard was prominent in education at Vancleave. It is believed that he designed and donated half of the lumber for the Vancleave Consolidated School, which was erected circa 1912. The small Lockard turpentine operation was located behind present day Cole's Drive Inn on Poticaw Road. Lockard expired on July 9, 1951. This concludes West Jackson County Naval Stores. It is a very long and detailed story. Unfortunately, this essay only touches some of the players and areas involved. Possibly someday, someone will pursue the chronology of the naval stores industry in Jackson County with more intensity. Many thanks to Kip Dees and Jacob T. Lockard (1909-1998) of Vancleave for sharing their knowledge of the naval stores industry in their sector of Jackson County. If you are interested in naval stores, the only complete book on this subject to my knowledge has just been released. It is appropriately titled, Treasures of the Longleaf Pines-Naval Stores (1998). It was written by Caroll B. Butler of Shalimar, Florida. Mr. Butler is a retired aerospace engineer degreed from Georgia Tech and Notre Dame. His interest in naval stores began as a lad on his father's farm in South Georgia. Butler's book is well illustrated with drawings and photographs. It sells for approximately $40.00. Order from Tarkel Publishing PO BOX 45 Shalimar, Florida 32579. Cyril E. Cain, Four Centuries on the Pascagoula, Volume I, (The Reprint Company: Spartanburg, South Carolina-1983), p. 148. Patricia A. Fenerty and Pat W. Fernandez, 1880 Census of New Orleans (Volume II), (Padraigeen Publishing Company: New Orleans-1991), p. 164 and pp. 329-330. W.A. Cox and F.F. Martin, Facts About the Gulf Coast of Harrison County, Mississippi, (reprinted by Harrison County Publishing Co., Ltd.: Gulfport, Mississippi-1985), pp. 19-20. Nollie Hickman, Mississippi Harvest: Lumbering in the Longleaf Pine Belt (1840-1915), (The Paragon Press: Montgomery, Alabama - 1962). Thomas Hutchins, An Historical Narrative and Topographical Description of Louisiana and West Florida, (facsimile reproduction of the 1784 edition-University of Florida Press: Gainesville, Florida-1968), p. 63. Harrison County, Mississippi Will Book 4, "Estate of C.B. Elarbee", pp. 159-160. Great Dates of History, (Historical Pamphlet of the Peoples Bank of Biloxi), (Peoples Bank: Biloxi, Mississippi-1976), pp. 16-18. The History of Jackson County, Mississippi, "John Champlin Gay", (Jackson County Genealogical Society: Pascagoula, Mississippi-1989), pp. 215-216. The History of Jackson County, Mississippi , "The Walden Family", (Jackson County Genealogical Society: Pascagoula, Mississippi-1989), p. 380. The Mississippi Gulf Coast Yesterday and Today (1699-1939), (Gulfport Printing Company: Gulfport, Mississippi-1939), pp. 32-33. The Journal of Southern History, "Slavery, Work, and the Geography of the North Carolina Naval Stores Industry, 1835-1860", Volume 62, No. 1, February 1996, pp. 30-31. Jacob Reddix, A Voice Crying in the Wilderness, (University Press of Mississippi-Jackson, Mississippi-1974), pp. 29-30. Twentieth Century Coast Edition of the Biloxi Daily Herald, "Zachary Taylor Champlin", (Biloxi Daily Herald: Biloxi, Mississippi-1902), p. 56.
Who's Who in Louisiana and Mississippi (1918), (Times Picayune: New Orleans, Louisiana-1918), p. 50 and p. 99. WPA For Mississippi Historical Data-Jackson County,(State Wide Historical Project-1936-1937), p. 326. The Biloxi Daily Herald, "Gay-Champlin", December 9, 1903, p. 1. The Biloxi Daily Herald, “City News”, September 21, 1904. The Biloxi Daily Herald, "C.C. Orrell", August 29, 1906, p. 4. The Biloxi Daily Herald, "Aftermath of Great Storm", September 28, 1906. The Biloxi Daily Herald, “Storm news grows worse”, September 29, 1906. The Daily Herald, “Bids Received For Gay Building”, August 2, 1910, p. 4. The Daily Herald, “Pine trees on Cat Island to be tapped", March 14, 1911, p. 4. The Daily Herald, "Turpentine Men to be Charged With Peonage", August 18, 1911, p. 1. The Daily Herald, “Work progressing at new factory”, October 16, 1912. The Daily Herald, “Another brick building for Biloxi”, July 7, 1913. The Daily Herald, “Lay foundation for Gay Building”, November 11, 1913. The Daily Herald, “Gets contract for roofing”, November 19, 1913. The Daily Herald, “Turpentine Men Gather In City”, December 5, 1913, p. 1. The Daily Herald, “Formal opening of Picard-Gillen”, April 9, 1914, p. 2. The Daily Herald, "Florala Still is Rebuilt in Jiffy", May 30, 1916, p. 8. The Daily Herald, "Turpentine men to stop exodus", December 13, 1916, p. 1. The Daily Herald, "Mr. Elarbee Dies at 3 A.M. Today", February 6, 1917, p. 3. The Daily Herald, “Naval Stores again slump”, April 24, 1917, p. 3. The Daily Herald, "Negroes Continue to Leave", June 18, 1917, p. 3. The Daily Herald, "L.V. instead of F.E. Pringle", January 26, 1918. The Daily Herald, "Death Takes F.E. Pringle", November 27, 1925. The Daily Herald, "Mrs. F.E. Pringle Taken By Death", March 19, 1927. The Daily Herald, "J.F. Payne Goes to His Reward", October 18, 1929, p. 1. The Daily Herald, "Mrs. Pringle Dies at Biloxi", May 6, 1935, p. 1. The Daily Herald, “Now it is turpentine”, July 31, 1936, p. 7. The Daily Herald, "L.V. Pringle, Sr. Dies at Biloxi Home After Long Illness", October 9,1938, p. 3. The Daily Herald, "D.J. Gay Dies in Tampa; Funeral To Be Held in Biloxi", December 5, 1949. The Daily Herald, "Mrs. Lou Don Payne", January 28, 1959, p. 2. The Daily Herald, "Mrs. D.J. Gay", February 11, 1964, p. 2. The DeFuniak Springs Herald-Breeze, “Reflections On Life in a Turpentine Camp”, June 24, 1976, p. 7-C. The Jackson County Times, “Turpentine Tax Law held invalid”, December 16, 1916, p. 1. The Jackson County Times, “Local News Items”, August 5, 1917. The Jackson County Times, "Death of John Robinson", October 19, 1918. The Mississippi Press, "Latimer, Once-thriving center still active, growing", January 30, 1989, pp. 1-A and 2-A. The Ocean Springs News, "Local News", June 25, 1910. The Ocean Springs News, "Big Land Deal Consumated", December 3, 1910, p. 1. The Ocean Springs News, "Another Big Land Deal", December 24, 1910, p. 4. The Ocean Springs News, “Local News”, November 7, 1909. The Ocean Springs News, “Geo Robinson”, March 18, 1915. The Ocean Springs News, "Ocean Springs to Get First National Bank", July 5, 1967, p. 11. The Ocean Springs Record, "J.C. Gay Political Ad", May 17, 1967, p. 2. The Ocean Springs Record, "J.C. Gay Obit", July 24, 1975, p. 1. The Progress, “The Turpentine Industry”, January 30, 1904. The Progress, “Local News Interest”, April 2, 1904. The Times Picayune, "Buckner Chipley", April 20, 1945, p. 2. The Times Picayune, "Anita Galt Chipley", November 28, 1949, p. 2. The Times Picayune, "W.B. Gillican", March 31, 1954, p. 8. The Sun Herald, South Mississippi Neighbors, “The face of history”, November 7, 2003, p. 12-13. Carroll Butler-Shalimar, Florida, December 1996. With the current interest shown by Frontier Natural Gas of Houston, Texas in nominating and leasing the water bottoms owned by the people of Mississippi in the Gulf of Mexico south of Horn Island, it may be appropriate to review the chronology of oil and gas exploration in Jackson County, Mississippi. 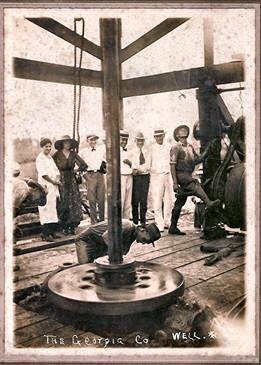 Although the first commercial hydrocarbon deposit in Mississippi, was first discovered in the Black Warrior Basin of northeastern Mississippi, at the Amory Gas Field in Monroe County in 1926, oil and gas explorers had been searching at Jackson County as early as 1911. In fact, the first bore hole in the county drilled exclusively for hydrocarbons actually discovered natural gas at a depth of 2140 feet in the Kreole (Laine) area, east of Pascagoula. Mississippi became a serious target for oil exploration after the large Tinsley Field at Yazoo County was discovered by Union Producing Company in August 1939. The field has produced over 200 million barrels of oil, and is the second largest in the state. Only the Baxterville Field in Lamar and Marion Counties has exceeded the oil production at Tinsley, which has undergone a recent revival with deeper deposits of natural gas and oil being discovered on its northern flank. Deep drilling continues here today as well as at Baxterville. Oil was discovered in coastal Mississippi at Ansley, Hancock County in 1955. Additional discoveries at Hancock County have been at Kiln (1959), Waveland (1965), and Catahoula Creek (1981). These four fields have produced over 165 billion cubic feet of gas and 4 million barrels of oil from depths ranging from 10,300 feet to over 20,000 feet. Catahoula Creek is one of the deepest producing fields in the world. Of the approximate forty wildcat tests drilled in Jackson County, forty per cent were dug before 1940, a period in which the more sophisticated exploration tools, seismography and wire line electric logs, were not available or were in their very early phases of technology. Sparse subsurface well control in Jackson County is indicated by the fact that only one well has been drilled per twenty square miles. Of these wildcat tests, only eight have gone below ten thousand feet. They indicate that the structural configuration of strata above fourteen thousand feet below the surface of the ground are dipping southwest. At these levels, closed anticlinal structures capable of trapping commercial hydrocarbons appear to be absent in the county. With this background, let the oil exploration began! The Pascagoula Development Corporation drilled the first well in search of hydrocarbons at Jackson County. It was called the No. 1 de Lamorton and located east of Laine (Kreole) in the SE/4, SW/4 of Section 28, T7S-R5W. The Laine well was spudded in on May 23, 1911. The Pascagoula Development Corporation was formed in March 1911, with a capitalization of $15,000. This was increased to $30,000 in May 1911. Its purpose was to operate, explore, and mine oil, gas, salt, sulphur, an other minerals. The incorporators were: F.H. Lewis, J.W. Zink, O.H. de Lamorton, R.P. Linfield, H. Herring, R.A. Farnsworth, S.H. Bugge, J.J. Clark, and George R. Thompson. The man who promoted the idea to dig this primary test well was Professor O.H. de Lamorton (1848-1918). According to his obituary published in The Pascagoula Democrat-Star on June 14, 1918, de Lamorton was born November 26, 1848 at Paris, France. His mother was English and he spent his childhood at London. de Lamorton graduated from the schools of geology and mineralogy at London, Paris, Berlin, and Vienna. At an early age, he apparently gained practical experience in the Baku oil fields of Imperial Russia. Oil has been known in this region since the 6th Century B.C. where deposits called the "eternal fires" existed. At Baku, oil was initially collected from springs, shallow pits, and hand dug wells. In 1871, drilling for oil in deeper horizons commenced and production boomed. Foreign capital provided by the Nobel Brothers of Sweden fed the growth. It is possible that a young de Lamorton participated in this prosperous era at Baku. After departing Russia, de Lamorton came to North America. He settled at Canada for several years. Here the youthful adventurer claimed to have been a personal friend of Sir John Alexander MacDonald (1815-1891) who was the first premier of the Canadian Dominion. MacDonald is called the "father of the Canadian Federation", and also saw the completion of the Canadian Pacific Railroad. While a resident of our northern neighbor, O.H. de Lamorton received the highest awards for his garment cutting inventions from the Canadian government. Professor de Lamorton arrived in America about 1890. Here he began organizing garment cutting schools in many American states and Mexico. In 1892, de Lamorton married Louise Betz. The marriage lasted four years and produced a son, Frederic O. de Lamorton (1894-1981). de Lamorton married Nellie Larimore, probably a native of Oregon County, Missouri, at Galveston, Texas in 1901. When de Lamorton resided on the Texas coast, he could have been influenced by the great Spindletop oil boom of 1900. Here on a low mound near Beaumont, Captain A.F. Lucas completed a gusher using rotary drilling tools. This fabulous discovery accelerated shallow exploration drilling above salt domes throughout coastal Texas and Louisiana resulting in oil discoveries at Saratoga, Sour Lake, and Jennings. Nothing is known about de Lamorton's life from 1900 until he arrives in east Jackson County in late 1909. Here he and Mrs. Nellie de Lamorton began acquiring land primarily in Section 28 and Section 32 of T7S-R5W. They founded the Laine or Riverside Subdivision in July 1911 from forty acres in the SW/4 of the SW/4 of Section 28, T7S-R5W. A twelve-acre reservation for the de Lamortons was created in the northeast corner of this tract. Professor de Lamorton erected a house here in November 1911. It was described as two-story, quite large and made an attractive appearance. To raise drilling capital and promote the Laine well, Professor de Lamorton gave lectures at Pascagoula, Ocean Springs, and Biloxi. He presented a theory that oil would be found in eastern Jackson County because the "Pennsylvania Flow", a stratified vein of oil, which was present below the earth and flowed southeastward from Pennsylvania, would be intersected by the Laine test bore. de Lamorton was probably referring to the "oil vein" that Colonel Drake discovered with America's first oil well at Titusville, Pennsylvania in 1859. His theory also implied that the volcanoes of the world were fed from these "streams of underground oil". de Lamorton came to Ocean Springs on March 23, 1911. He gave a free illustrated oil lecture to the business and professional community of the town at the Volunteer Hook and Ladder Hall on Washington Avenue. It appears that Professor de Lamorton was not successful in promoting the conservative entrepreneurs of Ocean Springs into investing capital in the Laine venture. At Biloxi, in April 1911, Professor de Lamorton was more convincing in the economic potential of his oil venture as he successfully sold stock in the Pascagoula Development Corporation. He enticed many influential citizens, who were members of the Biloxi Commercial Club, to invest in this exploration well. In early November 1911, with news of the Laine gas discovery wildly circulating, others became interested in the hydrocarbon potential of the area. Henri T. Beauregard, son of the famous Confederate general, Pierre G.T. Beauregard, met with W.A. Pollock & Judge Charles E. Chidsey and inspected 120 acres of their lands. He leased several hundred acres near the beach at Pascagoula from Pollock, Chidsey, and the Chastang families. The Bellevue Oil Company of New Orleans was formed to drill a well on the W.A. Pollock property. The officers and directors of Bellevue Oil were: Dr. H.S. Jenson (NOLA), president; Dr. Thomas W. Carey (NOLA), vice-president; Walter Winn Wright, secretary-treasurer; Henri T. Beauregard (NOLA), W.A. Pollock (Pascagoula), and Judge C.E. Chidsey (Pascagoula). In December 1911, C.E. Chidsey was the local agent for the stock, which was selling for $.10 per share. The company stated that "our derrick is built, the machinery ordered, and will be on the ground not later than January 1, 1912". The Bellevue Company drillers were Cole and Doucet while H.T. Beauregard was the field manager. The Bellevue No. 1 well commenced boring in February 1912, on the Pollock property. Before surface casing was set, a show of oil was reported at a depth of 34 feet. A second oil show was observed at 45 feet. The driller sampled blue clay at this shallow depth. In mid-March 1912, the well reached 555 feet. The driller reported that an oil bearing sand was encountered from 525 feet to 555 feet (30 feet). It was believed that the well had bottomed in cap rock. Tests were proposed at 245 feet and 548 feet. No further reports were issued from the newspaper. The Ocean Springs News reported on October 28, 1915, that Mr. W.R. David (1869-1919) while boring a hole in search of water hit a flow of natural gas at 500 feet. The gas flow was sufficient to ignite. The David place was located in the NE/4 of Section 14, T4S-R8W in an area then known as the Cartersville community. It is also the highest elevation in Jackson County at over 180 feet above mean sea level. No further information. In 1917, the Atlas Oil Company, a Chicago corporation, which was headquartered at Shreveport, Louisiana, became interested in exploring for oil in Jackson County. Millionaire Potter Palmer Jr. of Chicago was the president. Palmer may have been affiliated with the Armour Packing Company. A.F. Crider, company geologist and formerly a geologist with the United States Geological Survey, selected the drill site on the Henry E. Woodman (1850-1929) tract in Section 15, T6S-R7W, east of Vancleave. Atlas had secured a 30,000-acre lease block in the area. The annual rental was $.50 per acre and a 1/8 royalty was given the lessor. A test well was promised within four months. In early April 1917, the teamsters of Ben O' Keefe (1894-1954) operating out of Ocean Springs hauled machinery and pipe to the drill site, probably from the L&N rail yard. There was always one to four teams busy in the movement of supplies to location. By early May, the Woodman well was at a depth of 1600 feet. It was abandoned in late May or early June at a depth of 2762 feet. Atlas moved their drilling rig and equipment four miles east of the abandoned well to a new location on Marsh Island in the West Pascagoula River just above Martin's Bluff. This particular site was chosen on the basis of escaping gas from a sand bar at the mouth of Dead River. The No. 2 H.E. Woodman was drilled in Section 20, T6S-R6W, and abandoned at 2654 feet in August 1917. During the digging of this well, a high board fence was built around the location and visitors were not allowed on the drill site. Drillers and roughnecks were sworn to secrecy. One of the men told his wife that there had been a "gas blowout" and he was promptly fired. This hole was plugged and abandoned and the rig moved to Louisiana to drill for the Standard Oil Company. Robert Baize was the manager representing Atlas on the well. In July 1919, the Atlas Oil Company brought in the largest gas well in the world at Houma, Louisiana. The Monarch Oil and Gas Company was chartered in June 1917, by E.A. Clark, W.G. Clark, and E.L. Snyder. The company was domiciled at Pascagoula and organized to operate with $10,000 of capital stock. At this time, there was an Edwin A. Clark (1853-1936) and his son, Walter Clark (1881-1955) residing at Ocean Springs. Mr. E.A. Clark was a Massachusetts native. Circa 1878, he married Katherine T. Glasscock (1853-1930) of Concordia Parish, Louisiana. Their other children were: Charles E. Clark (1879-1945) and Sylvia Clark (b. 1883). No further information. The Georgia Company was headquartered at Atlanta, Georgia with Dr. J.N. Brawner serving as president of the organization. In the summer of 1920, they drilled a well, probably the No. 1 Waterman, in Section 4, T7S-R5W near Helena Station. Ten inch casing was set at 400 feet in July 1920. The company announced in early August 1920, that they had struck gas and oil-bearing sands at 900 feet. A bailer was ordered. General manager and vice-president of the Georgia Company, Captain Bruce, anticipated a small volume pumping oil well. The hole was drilled to a depth of 2000 feet and abandoned. No further information. In March 1921, the Georgia Company planned to put down another well on their leases near Helena. Nearly half the funds for the new well had been raised. It was generally believed that if the original well had been properly managed, a commercial oil well would have been completed. The Jackson County Oil Company was incorporated in March 1921. It was led by F.H. Lewis. Other organizers were: C.G. Scott, J. Bounds, K.W. Burnham, Jesse W. Thompson, T.G. Hibbler, W.F. Kohler, E.B. Dunten, J.J. McIntosh, and G.F. Mansfield. They put down a test hole near the Georgia well in Section 4, T7S-R5W. Called the Waterman bore, it spud in May 1921, and made 1275 feet in ten days. The driller set 8" casing at that point. The Jackson County Oil Company expected to find oil at 1313 feet were oil shows were reported in the Georgia well. This was the third effort by the citizens of Pascagoula and Moss Point to find oil in this area of Jackson County. The well probably reached a total depth of 1387 feet before abandonment. At the same time, the Sea Coast Oil Company, which had been organized by J.J. McIntosh and T.G. Hibbler, was reported to be at a depth of 864 feet in their wildcat well on Crooked Bayou. This well was spudded in on July 31, 1920. A string of 12 1/2 " casing was set at 170 feet. Seacoast drilled to a depth of 4000 feet and abandoned the borehole in March 1921. In 1921, the L.N. Dantzler Lumber Company filed a lawsuit, known as Jackson County, Ms. Chancery Court Cause No. 4172, against Sea Coast. Dantzler was owed money by the oil company and on June 17, 1921, Fred Taylor, Special Commissioner of the Jackson County Chancery Court, sold to the highest bidder for cash the following property of Sea Coast: 3500 feet of 4 "drill pipe, 3000 feet of 6" drill pipe, 4000 feet of 3" drill pipe, 2400 feet of 8" casing, 989 feet of 10 " casing, one Standard rig complete with boiler, rotary, engine, pumps, hose, pipes and connections, a 112-foot high wooden derrick and other paraphernalia used in drilling the Sea Coast Oil Company well on Crooked Bayou. L.N. Dantzler and H. Weston Lumber Company bought the drilling equipment and pipe for $6000 at the auction. In 1922, entrepreneurs from Georgia, again became involved in oil exploration in eastern Jackson County. This time it was the Great American Oil Company headed by Edgar L. Martin of Atlanta, Georgia. The Board of Directors for the company were: Edgar L. Martin (Atlanta), Emma T. Martin (Atlanta), James H. Crichton (Toronto), Miss A. McCaw (Toronto), Mrs. Margaret Hyslop (Toronto), Frank L. Hudson (Pascagoula), and E.H. Bacot (Pascagoula). Edgar L. Martin was a graduate of the University of Mississippi. He claimed to have been an official of the Mississippi State Legislature and Constitutional Convention. Martin also published The New Mississippian at Jackson with his brother, John H. Martin. Later he founded the Georgia-Alabama Business College at Macon, Georgia. His wife, Emma T. Martin, was a native of Hinds County, Mississippi. She attended Mississippi College for Women at Columbus and was an honor graduate of that institution. The Martins resided at 840 Polk Street in Atlanta. The Great American Oil Company could boast of a dozen or more professors and businessmen from Georgia as stockholders. Among them were Congressman Upshaw of Atlanta, and Mr. Paschall, the editor of The Atlanta Journal. There were also six citizens of Canada, and Mrs. N.E. de Lamorton of Kreole, the widow of the late O.H. de Lamorton. In January 1923, Mr. Martin entertained several Canadian investors from Toronto. They were impressed with the landscape and fertility of the soil of Jackson County. Their visit to the area corroborated the reports of the surface indications of the presence of oil in the region. Martin was also impressed with the Canadians as he praised them in The Chronicle-Star for their honesty, loyalty, and business acumen. In 1922 at Kreole, not far from the original No. 1 de Lamorton potential gas well of 1911, the Great American Oil Company spudded their first attempt to find production, the No. 1 Emma T. Martin. They abandoned the No. 1 Emma T. Martin at a depth of over 3300 feet in January 1923. In late 1922, three joints of 3 inch drill pipe were twisted off, and later a 900-foot fish consisting of 4" drill pipe was left in the hole. The company rig was skidded 60 feet west of the original location. Great American Oil officials designated the new borehole the No. 1 Margaret Hyslop when it was spudded in February 1923. Mrs. Hyslop was a member of the board of directors from Toronto. Oil shows encountered in the No. 1 Martin were the reason the new hole was drilled near the abandoned well. E.H. Liniam was the head driller. In late March 1923, the Canadian directors of the Great American Oil Company entertained the company officials and drilling crew of their No. 1 Hyslop well. A dinner was held at the Splendid Cafe in their honor. The Great American Oil Company No. 1 Hyslop reached 5243 feet in 1925. It was abandoned with shows of natural gas. Some people at Ocean Springs got involved in the oil business in the late 1920s, when Haroldson Lafayette Hunt (1889-1974), better known as H.L. Hunt, came to town seeking investors. In 1920, his sister, Florence Hunt Wright (1875-1961), arrived at Ocean Springs from Ramsay, Illinois, with her husband, J.C. "Jack" Wright (1879-1941), and their children: Curtis Wright (1906-1953), Sherman Wright (1908-1982), and Eleanor W. Scharr (1913-1953). In November 1919, Wright and Hunt had purchased 134 acres of pecan orchard land from L.E. Chase for $24,000. The land was located in the SW/4 of Section 20, T7S-R8W. Here, Jack Wright farmed, grew pecans, raised fowl, and in 1925, commenced a dairy farm, which became the Fort Bayou Dairy. The Wright-Hunt tract which has become known today as the "Hunt property" is east of the Spring Plaza Shopping Center on Bienville Boulevard and included the US Post Office lot (2.48 acres) which was carved out in 1985. The "Hunt property" sold in February 1994, and the new owners have just commenced roads and drainage to improve their investment now called "Maurepas Landing". Commercial and residential lots will be sold in the near future. J.K. Lemon remembers vividly the day the Wright family drove into a sleepy Ocean Springs. He was a five-year old towheaded lad living at 16 Iberville Drive. Jack Wright stopped in front of the Lemon home to ask Mr. Lemon directions to their new property. The Wright touring car had an Illinois license plate and was encased in several laminae of red clay dust reflecting the dry unpaved roads, which they had recently traveled. That evening Mrs. Lemon prepared vegetable soup and visited the Wright home with her gastronomical welcome. Being Midwesterners, they weren't accustomed to having large chunks of beef in their "vegetable" soup. The Wrights were delighted with the meal and called it "animal" soup! Before H.L. Hunt hit black gold in the super giant East Texas in 1930, he was a drifter, gambler, cotton farmer, and land speculator. This Illinois native speculated in land all the way from Arkansas, where he settled in 1911, to south Florida. In southeastern Arkansas, Hunt farmed cotton, and when the price of that commodity soared during WW I, he made a small fortune. By 1921, cotton prices were down and Hunt was holding thousands of acres of mortgaged farmland. He nearly went under, but lady luck followed him to the poker table and his winnings kept him solvent. At this time, Hunt heard of a wildcat well drilling near El Dorado. This was the first of the many oil booms that he would follow. The Jackson County Times of February 11, 1922, reported that Jack Wright had gone to El Dorado, Arkansas to inspect a prolific oil well in which he had an interest. Wright was a majority interest owner in the company, which owned the well. It had the potential of paying him $100 per day. Obviously, it was the well of brother-in-law, H.L. Hunt. As H.L. Hunt was pursuing the drilling rig from oil bonanza to dry hole in Arkansas and North Louisiana, he was in continuous need of capital for buying mineral leases and promoting wells. On one of his visits to Ocean Springs in the 1920s, where his family stayed with the Wrights on occasions, he solicited several local merchants and businessmen to invest in his fledgling companies, Tenable Oil and H.L. Hunt, Inc. The son of one of the investors related that his father invested about $3,000 in the Hunt ventures. He said that Mr. Hunt bought all of his stock back and returned 6 percent on the investors’ risk capital. In 1930, when Dad Joiner's No. 3 Daisy Bradford, the discovery well for the East Texas Field, came in flowing thousands of barrels of oil, H.L. Hunt was there to buy Joiner's leases. This was the oil discovery, which would provide the cash flow to build the great Hunt petroleum empire composed of Placid Oil, Penrod Drilling, Panola Pipeline, Parade Gasoline, Hunt Production, Hunt International, and Hunt Oil. Unfortunately, Hunt's Ocean Springs investors were not in the East Texas oil discovery. One can imagine that through the years they must have spoken of their association with the legendary oilman and rued their bad timing and luck. In the 1930s, the Gulf Refining Company was the first "major" oil company to drill in Jackson County. They put down five shallow stratagraphic tests in the county on lands owned by the L.N. Dantzler Lumber Company, between January 1933 and June 1933. None of these bore holes penetrated deeper than 3600 feet. In August 1939, The Union Producing Company discovered oil at their No. 1 G.C. Woodruff on the Tinsley Dome in Yazoo County. This event propelled Mississippi into a wild oil exploration frenzy for the next decade. Only one wildcat well was drilled at Jackson County in the 1940s, but it was the deepest well ever to date. Humble Oil and Refining Company (now Exxon) drilled the No. 1-B Dantzler Lumber Company to 11,374 feet at a location in Section 20, T5S-R8W. The dry hole was abandoned in June 1943, in rocks of Lower Cretaceous age. In January 1945, the State of Mississippi leased 400,000 acres of water bottoms in the Mississippi Sound. The lease block ran from Biloxi eastward to the Alabama state line. Kerlyn Oil Company of Oklahoma City, Oklahoma paid the State $25,000 for the lease, which granted a one-eight royalty to the lessor. Rentals were ten cents an acre. It was anticipated that marine seismic exploration would be conducted on the block. The early months of 1950 began with hope for Clifton Leroy Dees (1886-1963) of Vancleave when the Southeastern Drilling Company of Bill Clements, I.P. Larue Sr. and sons of Jackson, Mississippi, and McComb wildcatter, J.R. Brown, spudded in a wildcat well on an oil prospect just north of Vancleave and southeast of Spring Lake on McGregor Road in Section 28, T5S-R7W. Before WW I, Mr. Dees, an Alabaman by birth, had come to Jackson County from Millsaps College at Jackson. He worked for the L.N. Dantzler Lumber Company commissary at Vancleave until the war called him to military service. Dees came back and opened his Red Cash Store across the street from the commissary. He bought the Dantzler store in 1926, for $17,500 renaming it the Dees General Merchandise Store. It was a trading post, post office, and telephone office, located near the confluence of Bluff and Moungers Creek in the vicinity of the old Ramsay-Anderson store. In this area, once known as Schooner Landing, where the charcoal schooners moored and loaded their holds and decks with canvas "charcoal barrels" for the New Orleans market, Mr. Dees worked hard and succeeded in life acquiring vast stands of timber and turpentine lands. With his brother, Mendum H. Dees (1884-1949), he also founded Dees Chevrolet at Biloxi in August 1925. They also sold Frigidaires and air conditioners. Like Jackson County's first wildcatters, Professor O.H. de Lamorton (1848-1918) and Frank H. Lewis (1865-1930), Cliff Dees felt strongly that there was oil beneath the pine and savanna lands of central Jackson County. Dee's interest was so keen to find oil that he invested a portion of his personal fortune to locate the elusive black gold. Although the Dee's test well was abandoned at 9030 feet in the Lower Cretaceous, it was reported from the drill site that three feet of oil stained sand was recovered in a conventional core at 8136-8144 feet from the Tuscaloosa Formation, which is the most prolific oil producer in Mississippi. In February 1950, the sand was drill stem tested, but only gas cut mud and saltwater were recovered. Exploration activity intensified at Jackson County in February 1954, when the Gulf Refining Company announced that it and associates, Benedum-Trees and Melben Oil of Pittsburgh, would drill a 12,000-foot wildcat off the west end of Horn Island. In 1952, Gulf and Melben had acquired mineral leases on the entire Mississippi Sound. The Horn island wildcat, was called the C.A. Floto No. 1 State of Mississippi, and spudded in on February 18, 1954. While the Floto offshore well was drilling, the Southland Oil Company of Yazoo City announced plans to build a 20,000 barrel a day oil refinery at Pascagoula. It wasn't until 1961, that the Standard Oil Company of Kentucky commenced erecting a 100,000- barrel a day refinery there. This plant was the nucleus of the present day Chevron refinery at Pascagoula. The channel, harbor, and turning basin to accommodate ocean going vessels on Bayou Casotte was dredged in 1958. The Horn Island well was plugged and abandoned in June 1954, as a dry hole after reaching a depth of 13,024 feet in rocks of the Lower Cretaceous Paluxy Formation. Three other wildcat tests were dug during the 1950s. Two were by J.R. Brown and Crow Drilling Company on International Paper Company lands in Section 17 and Section 22, T5S-R7W, four to six miles north of Vancleave. Both tests were to chase oil shows encountered in the Lower Tuscaloosa Formation by the Southeastern-Brown No. 1 Dees in 1950. Needless to say, the holes were dry and abandoned. The decade ended for wildcatters in April 1959, with a deep dry hole by the Weston Drilling Company on federal lands in Section 15, T5S-R9W, near the Larue community. Weston quit in the Paluxy Formation at 11,527 feet. Weston Drilling was owned by Clint Murchison Sr. His son was the founder of the Dallas Cowboys-America's team! The 1960s decade was a twin to the 1950s. Five dry holes were dug at Jackson County. The difference was that the drillers went deeper to test older rocks, primarily the Paluxy Formation of Lower Cretaceous age. Average depth of the 1960s wildcats was 11, 339 feet, while the 1950s tests reached an average depth of 10,255 feet. Wildcatter, Chesley Pruet of El Dorado, Arkansas, led the charge with three dusters. In 1974, Saga Petroleum, a Norwegian exploration company, began a deep exploration program in coastal Mississippi after acquiring leases and exploration data from a Tulsa, Oklahoma independent operator. They drilled a deep Jurassic test north of Grand Bay, Alabama. It was two miles east of the Jackson County-Mobile County line. The Saga No. 1 Dees went to 18,500 feet and drilled into an argillite Paleozoic basement. This deep wildcat created interest along a geologic structure known as the Wiggins Arch and resulted in Amoco and Saga drilling a deep test in northern Jackson County, southeast of Wade. They completed their No. 1 Cumbest as a dry hole after it reached a total depth of 18826 feet in igneous rock below Jurassic formations on March 17, 1977. In 1979, the Lower Mobile Bay-Mary Ann gas field was discovered by Mobil Oil. The discovery well found the Jurassic Norphlet Sand porosity at 20,600 feet below the seabed about two miles east northeast of Dauphin Island. This area has been actively explored since this time by Mobil, Exxon, and Shell resulting in additional deep gas fields discoveries at: West Dauphin Island, Bon Secour Bay, North Central Gulf, Northwest Gulf, and Fairway. Reserve estimates are several trillion cubic feet of natural gas making Lower Mobile Bay one of the most significant hydrocarbon discoveries ever in the continental United States. The economic significance of these deep gas discoveries in Lower Mobile Bay would lead explorers to search for hydrocarbons in the Jurassic Smackover-Norphlet formations in northern Jackson County in the 1980s. The decade closed with a deep Lower Cretaceous dry hole by Florida Gas on the Upton David farm located in Section 14, T4S-R8W. It reached 14,500 feet in November 1979. Sands of the Hosston formation were the primary objective of this wildcat test. 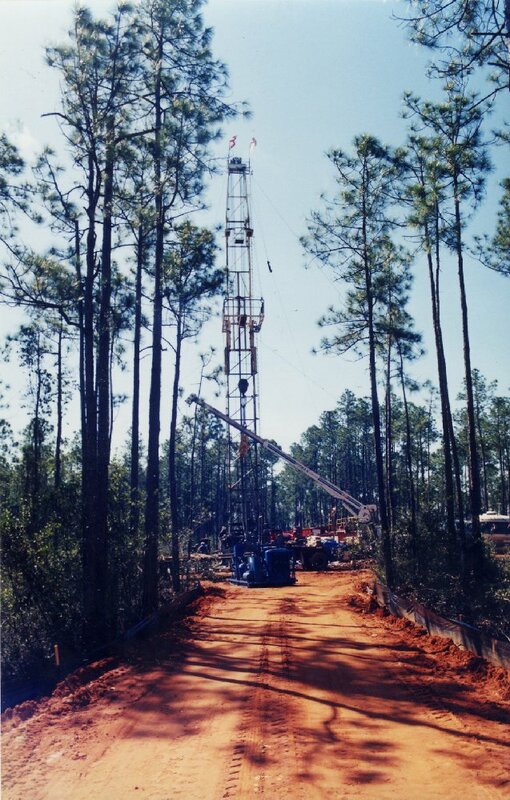 The Davis Oil Company also completed two shallow Miocene tests near Vancleave in late 1979. In late 1979, a very significant natural gas find at Baldwin County, Alabama near Foley, would effect future exploration drilling in Jackson County, Mississippi. Amoco Production Company while searching for deep natural gas and condensate in Jurassic rocks at the No. 2 Roy Amos 32-12, encountered 42 feet of gas productive sand in the Miocene at 1664 feet. This well discovered the Foley Field-West Foley field. By March 1983, the Foley area had thirteen producing Miocene gas wells. Cumulative gas production from these wells is about 14 billion cubic feet of natural gas. Subsequent exploration for shallow Miocene gas led wildcatters to the west side of Mobile Bay in Mobile County, Alabama where in 1984, the Bayou Jonas field was discovered. Approximately forty small Miocene gas fields have been discovered in onshore Alabama and Alabama State waters. The nearest onshore Miocene fields to Jackson County are located between Bellingrath Gardens and Cedar Point, north of Dauphin Island. These small shallow hydrocarbon accumulations have been non-commercial. Several small commercial Miocene fields have been discovered in Alabama State waters north of Dauphin Island. The largest of these appears to be the Atlantic Richfield Miocene natural gas discovery in Mississippi Sound Block 73, called North Dauphin Island. Five shallow wells here have produced about 25 billion cubic feet of dry gas. Callon Petroleum of Natchez now operates this field. As a result of the discovery at Foley-West Foley in Baldwin County, and the small fields on the west side of Mobile Bay, explorers began in late 1979 to look to the west on trend for Miocene gas accumulation in Jackson County. Davis Oil Company abandoned three shallow Miocene wildcats between September 1979 and March 1980. Other dusters were experienced byAtlantic Richfield, St. Joseph Petroleum, and Imperial Resources. The deepest of these tests, which was dug by Imperial, went to 3540 feet, north of Graveline Bay. The deep Norphlet gas discoveries in the Lower Mobile Bay area would also tempt wildcatters to dig several tests along the Wiggins Arch which strikes east-west through northern Jackson County. Unfortunately these deep expensive bore holes by Champlin and Conoco were both abandoned below 18,500 feet. The Champlin well was the third deep test drilled near the Upton S. David (1908-1993) farm in the northeast quadrant of Jackson County. The 1980s also saw exploration on OCS (Outer Continental Shelf) tracts by the major oil companies in Federal waters south of Horn and Petit Bois islands. In 1985, Chevron discovered deep Jurassic Norphlet gas in its OCS-G-5062 No. 1 Mobile Area Block 861 well. This exploration test bottomed below 21,000 feet and was the first to discover commercial hydrocarbon deposits in offshore Mississippi waters. In 1988, Unocal (Union Oil of California) drilled a significant natural gas discovery also in federal waters about 20 miles south of Pascagoula on their OCS Block 904 lease. The discovery well test results were announced in February 1992 as 97.6 million cubic feet of gas per day from the Norphlet Sand between 22,130 feet and 22, 290 feet. Testing was delayed several years until valves and tubular goods with special design and metallurgical properties were built in order to withstand the high pressure, temperature, and hydrogen sulfide gas encountered in the Norphlet reservoir. The tests results from this well are the highest flow rates measured to date in the Mobile Outer Continental Shelf area and one of the best ever recorded for the entire Gulf of Mexico. The only well drilled onshore in Jackson County was the Coastal Exploration No. 1 Greene. It was abandoned at 3000 feet in Miocene age sediments in October 1991. The drill site was located in Section 33, T7S-R5W, southwest of the Finnish Church on Bayou Casotte Road, near the original Pascagoula Development No. 1 de Lamorton discovery of 1911. In November 1996, Frontier Exploration and Production Corporation of Houston, a wholly owned subsidiary of Frontier Natural Gas Corporation, headquartered at Oklahoma City, Oklahoma, proposed to the State of Mississippi that it nominate for public bid, approximately 60,000 acres of water bottoms in the eastern Mississippi Sound. The northern perimeter of the proposed tracts lies about eight miles south of Pascagoula and extends southward three to five miles south of Horn and Petit Bois Islands. It is believed that oil and gas exploration companies, who make successful bids on these proposed lease blocks, will attempt to find shallow Miocene sands that produce dry methane gas less than five miles from the eastern border of the proposed lease sale tracts at the Northeast Petit Bois Pass Field. This is a small, two well field in Mississippi Sound Block 71. Frontier Exploration & Production Corporation has been successful in Miocene gas exploration in Alabama State waters. In April 1995, they completed their No. 1 State Lease 746 in Mississippi Sound Block 59 as the discovery well for the Barron Point Field. The Frontier discovery flowed almost 4 million cubic feet of gas per day with a surface pressure of 867 psi. Legacy Resources now operates the two well field. In addition to the Chevron refinery on Bayou Casotte, it should be noted another oil related industry is active at Jackson County. The Ham Marine Inc. yard on the west bank of the East Pascagoula River at Pascagoula is busy upgrading and converting offshore drilling rigs. Presently, the yard has a semi-submersible upgrade and two jack up cantilever conversions in progress. In December 1996, Ham Marine announced that they would expand their operation to a 120 acre lease site at Greenwood Island on Bayou Casotte. The project was expected to cost 20 million dollars. Jackson County will contribute 6 million dollars to the enterprise for site preparation. With the major oil companies presently exploring for hydrocarbon deposits in waters as deep as 6,000 feet in the Gulf of Mexico offshore Louisiana and Texas, there is a demand for deep water rigs. Drilling contractors now command up to $45,000 per day for jack up rigs while semi-submersible rig rates are approaching $100,000 per day. The Rowan Companies are constructing two Gorilla class jack up rigs at their LeTourneau yard near Vicksburg, Mississippi. Sonat Inc., Shell Oil, and Amoco announced in late December 1996, the new $390 million Destin pipeline project that will transect Jackson County. The 210-mile, 36 inch gas line will originate seventy-six miles offshore at Main Pass Block 260 and make landfall at Pascagoula. It will have a capacity of 1 billion cubic feet of gas per day and connect with five interstate pipelines 134 miles north of the Mississippi coast. In addition, a $75 million gas processing plant will be built at Pascagoula. It will be jointly owned by Shell and Amoco who will supply natural gas to it. In January 2001, Merit Field LLC staked the No. 1 Exxon-Mobile near Fontainebleau, in the NW/4 of the SE/4 of Section 29, T7S-R7W. This well was plug and abandoned in Miocene age sediments in the spring of 2001 after reaching a total depth of 3700 feet. It has been over ten years since hydrocarbon hunters have bored into the subsurface of Jackson County, Mississippi in search of commercial deposits of oil and natural gas. Browning and Welch Inc. in September 1991, was the last operator to explore the region, but abandoned its No. 1 Greene 33-2 at 2850 feet in Lower Miocene age sediments, without any indication of hydrocarbons. Coastal’s drill site was situated in Section 33, T7S-R5W, southwest of the Finnish Church on Bayou Casotte Road, near a well drilled in 1911, by O.H. de Lamorton (1848-1918), a pioneer promoter, who lived at Laine, now Kreole. In January 2002, location for a 4000-foot, Miocene test was been staked by Merit Field, L.L.C of Florence, Mississippi at No.1 Exxon-Mobile. This venture is three-quarters of a mile east northeast of Fontainebleau, in the NW/4, SE/4 of Section 29, T7S-R7W, at the termination of Radio Road, about 2000 feet south of the WOSM radio station. Lyman Well Company of Gulfport drilled the surface hole for this proposed 4000-foot Miocene-Oligocene test. The operator set and cemented 300-feet of surface casing. The hole was plug and abandoned in Miocene age sediments in the spring of 2001 after reaching a total depth of 3700 feet. Drillers at Fontainebleau will primarily be seeking lower Miocene age, Amphistegina sandstone reservoirs, which are anticipated to produce dry methane gas. The well is expected to bottom in the Upper Oligocene Chickasawhay-Tampa carbonate zone, which has produced oil at Lake Borgne in southeastern Louisiana. Nearest subsurface control to the Fontainebleau prospect is slightly over one mile to the south-southeast at Imperial Resources No. 1 Allar, which was abandoned in April 1987, at a depth of 3450 feet. Nearest commercial Miocene natural gas production to the propose Fontainebleau wildcat lies in Alabama State waters north of Dauphin Island, about thirty miles to the southeast. The largest of the shallow Miocene gas fields that produce here is called North Dauphin Island. It is located in Mississippi Sound Block 73. North Dauphin Island was discovered in May 1990, by the Atlantic Richfield No.1 State Lease 686. Wells at 2000-feet in the North Dauphin Island Field have produced in excess of 25 billion cubic feet of dry gas. Recent exploration activity by Lewis Oil Corporation of Gulfport, Mississippi in southwestern Hancock County has brought wildcatters back into onshore coastal Mississippi. In 2001, Lewis Oil discovered an apparent commercial Miocene field called Mariner Field, which lies east of NASA and on the northern perimeter of Devils Swamp. Mariner Field has two productive wells from the Amphistigina biozone at 3900 feet. Four development wells have been staked in the field by Lewis Oil and J.R. Pounds, Inc. of Laurel, Mississippi. This new discovery is about fifty miles west of the Fontainebleau prospect. Since the first wildcat well was spudded in 1911, Jackson County has seen oil Explorers dig approximately forty dry holes. Optimal onshore exploration targets appear as extremes, i.e. shallow Miocene gas at 2,000-3,000 feet or deep Jurassic carbonates and clastics ranging in depth from 16,000-20,000 feet. As seismic exploration technology continues to improve, the oil industry will be more aggressive in testing high risk prospects involving stratigraphic and porosity traps. In concordance with these improvements, buried faults and other structural traps will also be better delineated in the subsurface. In November 1996, the United States was producing 6,523,000 barrels of oil per day. Sixty-six percent of this oil came from only three states: Texas, Alaska, and Louisiana. At this time, Mississippi was producing 53,000 barrel per day and ranked in a tie for eleventh place with Utah. It may be a surprise to some that Florida produces 19,000 barrels of oil per day. Our nation is currently importing over 9,700,700 barrels of oil per day, which is well over 50% of our daily needs. The OPEC countries of Venezuela and Saudi Arabia provide 47% of these imports while non-OPEC nations, Canada and Mexico, supply 27% of our daily oil imports. As this country becomes increasingly reliant on foreign oil imports, it will only be a matter of time before we witness another economic debacle as the Arab Oil Embargo of the 1970s. Someday oil explorers will return to onshore Jackson County and find a commercial field, but the reserves and economics will have to be appropriate for the dollars risked. Ray L. Bellande, "Professor O.H. de Lamorton", (unpublished essay), November 1995. Stephen D. Champlin, S. Cragin Knox, and T. Markham Puckett, Regional Geologic Framework of The Miocene, Coastal and Offshore Mississippi , Open-File Report 23, (Mississippi Department of Environmental Quality, Office of Geology: Jackson, Mississippi-1994), p. 44. Rick L. Ericksen and Stanley C. Thieling, Regional Jurassic Geologic Framework and Petroleum Geology, Coastal Mississippi and Adjacent Offshore State and Federal Waters, Open-File Report 22, (Mississippi Department of Environmental Quality, Office of Geology: Jackson, Mississippi 1993), p. 7. Dudley J. Hughes, Oil in the Deep South: A History of the Oil Business in Mississippi, Alabama, and Florida 1859-1945, (University of Mississippi Press: Jackson, Mississippi-1993), p. 39, and p. 160. Robert M. Mink, Charles C. Smith, Bennett L. Bearden, and Ernest A. Mancini, Regional Geologic Framework and Petroleum Geology of Miocene Strata of Alabama Coastal Waters Area and Adjacent Federal Waters Area, State Oil and Gas Board of Alabama, Oil and Gas Report No. 16, (Geological Survey of Alabama: Tuscaloosa, Alabama-1988), pp 30-33. Robert M. Mink, Ernest A. Mancini, Bennett L. Bearden, and Charles C. Smith, "Middle and Upper Miocene Natural Gas Sands in Onshore and Offshore Alabama", Transactions-Gulf Coast Association of Geological Societies, Volume XXXVIII- 1988. Sam L. Pfiester, "Miocene Production in Southwest Alabama", Transactions-Gulf Coast Association of Geological Societies , Volume XXXIII-1983, p. 175. John A. Warner, Regional Geologic Framework of The Cretaceous, Offshore Mississippi , Open-File Report 21, (Mississippi Department of Environmental Quality Office of Geology: Jackson, Mississippi-1993), pp. 27-28. The Oil & Gas Journal, "Gulf of Mexico action tightening worldwide offshore rig squeeze", November 25, 1996, pp. 27-28. The Oil & Gas Journal, "Industry Briefs", December 30, 1996, p. 35. Jackson County, Ms. Chancery Court Cause No. 4172, "L.N. Dantzler Lumber Co. et al v. Sea Coast Oil Company, et al", 1921. The Chronicle-Moss Point Advertiser, "Drill Oil Well Off County", February 12, 1954, p. 1. The Daily Herald, July 7, 1917. The Daily Herald, "Oil Lease", August 31, 1940. The Daily Herald, "Lease Eastern Part Sound For Oil Exploration", January 17, 1945. The Daily Herald, "Jackson County Seeks Permit For Oil Plant", June 1, 1954, p. 17. The Daily Herald, “Plan Oil Drilling in Latimer Section”, November 5, 1949. The Jackson County Times, "Local News Interest", December 9, 1916. The Jackson County Times, "Local News Interest", March 10, 1917. The Jackson County Times, "Atlas Oil Company To Begin Boring", March 17, 1917, p. 1. The Jackson County Times, "Local News Interest", April 7, 1917. The Jackson County Times, "Local News Interest", May 5, 1917. The Jackson County Times, "Local News Interest", June 9, 1917. The Jackson County Times, "Charter of Incorporation of the Monarch Oil and Gas Company", June 9, 1917, p. 4. The Jackson County Times, "Slim prospects for oil strike near Jackson", October 13, 1917, p. 1. The Jackson County Times, "Pascagoula Interests Will Again Sink Test Well", October 27, 1917, p. 1. The Jackson County Times, “To Bore For Oil At Rose Farm”, February 28, 1920. The Jackson County Times, “Local News Items”, February 28, 1920. The Jackson County Times, “Derrick Completed For Oil Company”, April 3, 1920. The Jackson County Times, “Local News Items”, April 17, 1920. The Jackson County Times, "Local and Personal", December 12, 1925. The Jackson County Times, "State Mineral Commission leases Coast Sound bottom for immediate oil tests", February 18, 1939, p.1. The Mississippi Press, "Ham Marine proposes $20M expansion", December 17, 1996, p. 1, cc. 1-2. The Mississippi Press, "Oil company picks Mississippi for pipeline", December 25, 1996, p. 1, cc. 1-6. The Mississippi Press, “Lawmakers: Drilling bill won’t affect DEQ authority”, March 9, 2004, p. A1. The Moss Point Advertiser, "President tells of Oil Company", March 10, 1922, p. 1, c. 6. The Ocean Springs News, "Oil Lecture! ", March 18, 1911. The Ocean Springs News, "Indication of Oil Found by W.R. David”, October 28, 1915, p. 1. The Ocean Springs Record, “Local site to be searched for oil, gas deposits”, February 21, 2002. The Pascagoula Chronicle, "Capital Stock of Oil Company Fixed at $15,000", March 11, 1911, p. 1. The Pascagoula Chronicle, "Amusements", November 11, 1911, p. 4. The Pascagoula Chronicle, "Young de Lamorton", November 18, 1911, p. 1. The Pascagoula Chronicle, "Professor de Lamorton Has Moved To Laine", November 25, 1911, p. 4. The Pascagoula Chronicle, "Bellevue Oil Company Will Begin Work at Once", December 9, 1911, p. 1. The Pascagoula Chronicle, "Progressing Nicely", July 30, 1920, p. 1. The Pascagoula Chronicle, "Pascagoula Territory Is Now a Proven Oil Field", August 6, 1920. The Pascagoula Chronicle, "Seacoast Oil Co. Begins Drilling", August 6, 1920, p. 1. The Pascagoula Chronicle, "Producing Well Is a Certainty", August 13, 1920, p. 1. The Pascagoula Chronicle, "May Bring In Oil Well Next Week", August 20, 1920, p. 1. The Pascagoula Chronicle, "Pascagoula is wild over oil", August 13, 1920, p. 4. The Pascagoula Chronicle-Star, "Another Oil Well", March 11, 1921, p. 1. The Pascagoula Chronicle, "The Charter of Incorporation of the Jackson County Oil Company", March 18, 1921, p. 8. The Pascagoula Chronicle, "Home Company Seeking For Oil", May 6, 1921, p. 1. The Pascagoula Chronicle-Star, "Helena Oil Well Looks Promising", June 3, 1921, p. 1. The Pascagoula Chronicle, "Commissioner's Sale", June 10, 1921, p. 4. The Pascagoula Chronicle, "Wells drilled for oil in Mississippi", August 5, 1921, p. 1. The Pascagoula Chronicle, "Canadian Visitors Greatly Delighted", January 12, 1923, p. 1. The Pascagoula Chronicle, "Second Attempt to Tap Wealth by Oil Company", February 2, 1923, p. 1. The Pascagoula Chronicle, "Canadians Entertain Oil Well Employees", March 23, 1923, p. 1. The Pascagoula Democrat-Star, "Mr. E.L. Martin", July 2, 1919, p. 5. The Pascagoula Democrat-Star, "Largest Gas Well in The World", July 30, 1919, p. 5. The Pascagoula Democrat-Star, "Oil Showing at Beach", February 16, 1912, p. 3. The Pascagoula Democrat-Star, "Bellevue Company Strikes Oil Sand", March 15, 1912, p. 3. The Pascagoula Democrat-Star, "Oil Interest Reviewed", May 31, 1912, p. 2. The Southeast Oil Review, "Unocal Tests Significant Gas Discovery in Federal Waters Offshore Mississippi", February 24, 1992, p. 1. The Southeast Oil Review, "Discovery in Miocene Tested by Frontier Off Mobile County", April 17, 1995, p. 1. The Southeast Oil Review, "Power Company plans observation well in Jackson County", October 15, 2007, p. 1. The Sun Herald, “Legislation would pave way for drilling in Miss. Sound”, March 3, 2004, p. A-1. The Sun Herald, “Drilling bill surprised local lawmakers”, March 4, 2004, p.
The Sun Herald, “Tempers flare over drilling legislation”, March 5, 2004, p. A-1. The Sun Herald, “No! No! No! to drilling in the Sound”, March 5, 2004, p. D-2. The Sun Herald, “Coast reps: Prohibit gas drilling near shore”, March 10, 2004, p. A-1. The Sun Herald, “Meeting on offshore drilling set for Monday”, March 13, 2004, p. A-1. The Sun Herald, “Drilling bill sails through legislature”, March 19, 2004, p. A-1. The Sun Herald, “Reserve May Face Drilling”, March 23, 2004, p. A-1. The Sun Herald, “Coming Up Empty”, April 3, 2004, p. A-1. The Sun Herald, “Offshore drilling compromise appears close”, April 4, 2004, p. A-1. The Sun Herald, “Pros, cons, of rigs in the water”, April 5, 2004, p. A-1. The Sun Herald, “New drilling concerns arise”, April 8, 2004, p. A-8. Gulf No. 2 Dantzler ?